This trip was more touristic-holiday-romantic then most of our travels. There were only two of us – Asia and Tom. 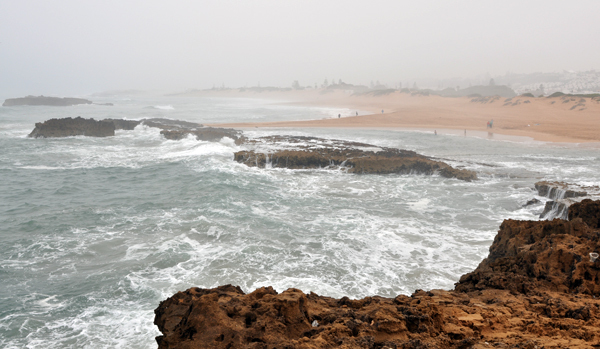 We decided to go to see the Atlantic shore in Morocco which unfortunately is quite far from any localities... 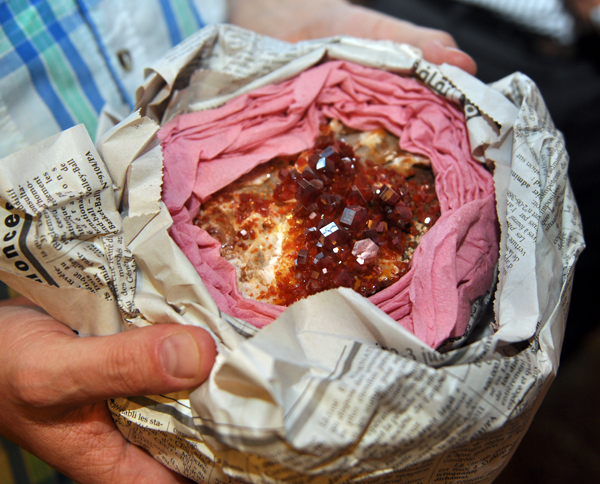 But of course we also visited several minerals occurrences. 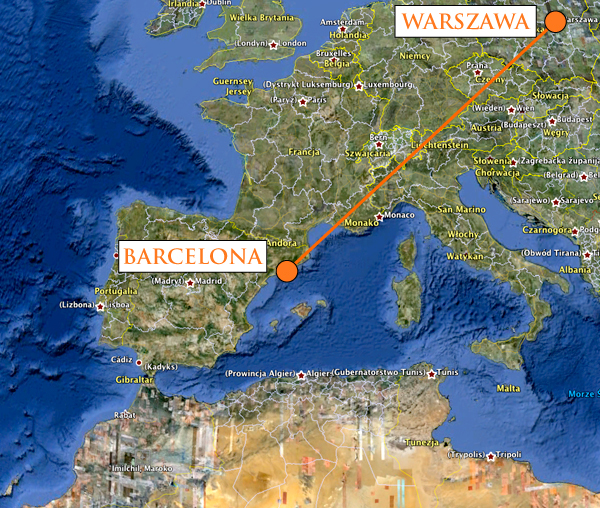 First we flew from Warsaw to Barcelona, where we spent 2 days. 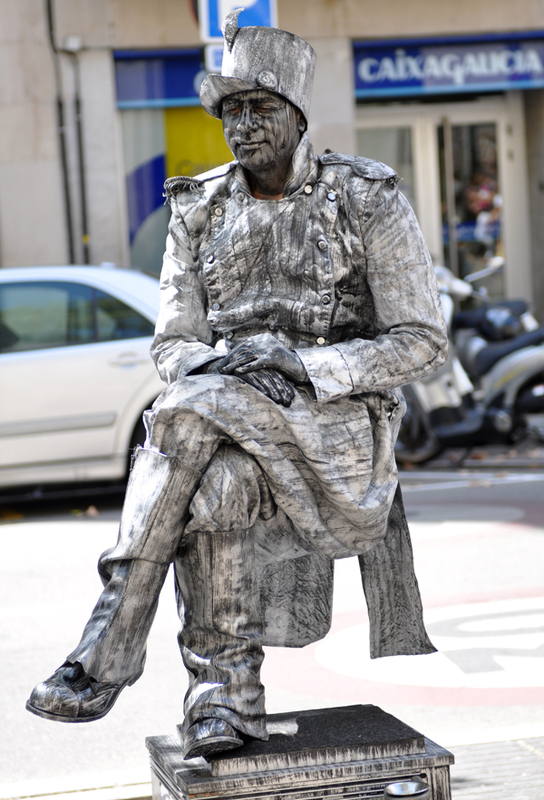 We stayed in a hotel close to the Rambla Street in the old part of Barcelona. 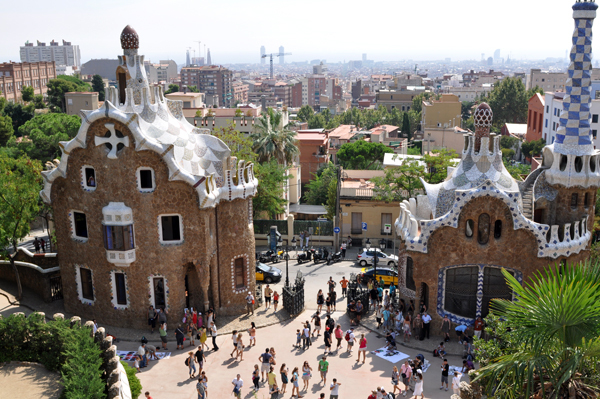 We spent there really great time visiting Gaudi`s famous buildings - Casa Batllo, Casa Mila, Sagrada Familia, Parc Guell but also oceanarium, old town, Camp Nou – the stadium of FC Barcelona (Asia is a big fan of them). Photos below will say much more then descriptions here. 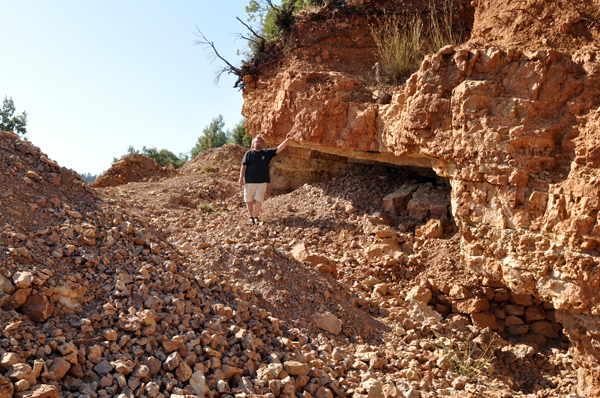 The only mineral-component of our visit in Catalonia was a great time, we spend with Joan Rosell Riba. who is a mineral dealer from Barcelona. He was our guide in Castell de Montjuïc from where you can see the whole city as it is located on the hill over the harbour (173 m high), we drank together a lot of beer and also had a look at some minerals. 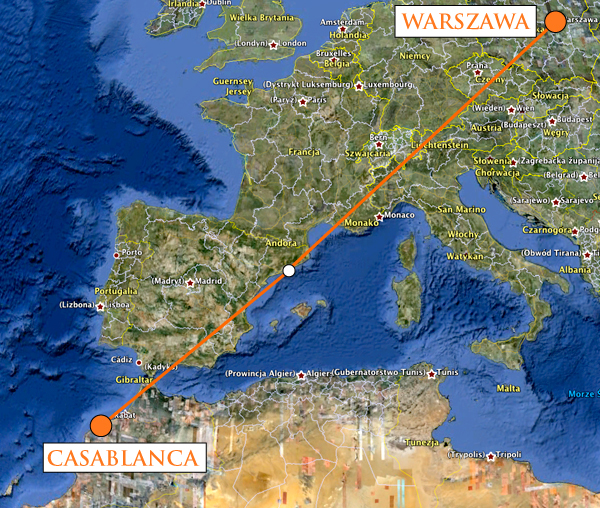 From Barcelona we flew to Casablanca where we rent a car and drove to El Jadida that is located on the coast. What surprised us there was a heavy fog everywhere around. The same evening we went for a short walk around El Jadida which is famous especially for its old part - Portuguese Fortified City of Mazagan, which was registered UNESCO World Heritage Site. Portuguese town was build by Portuguese in the early 16th century and it is completely surrounded by huge walls and moats. There is special small port inside the walls to unload the goods. Next morning we were even more surprised because the fog was still there... We made tour around the town again, it really amazed us. It is a shame that so many buildings there are collapsing and many places look more like ruins than a leaving town. 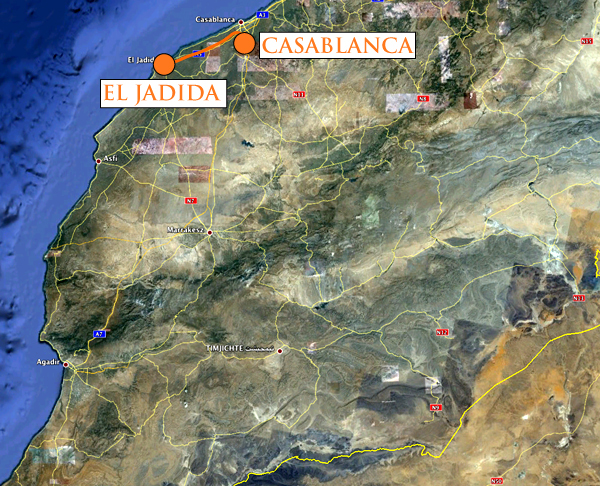 From El Jadida we drove to Oualidia – a famous resort popular mainly among moroccoan tourists. The fog was still with us and it started to be annoying. On another hand stony clifs submerged in the ocean in the fog created a quite unusual, Scotland like, view. However we expected other type of weather and when we woke up the next day and saw the for again we decided to change our plan – go to localities first and come back at the cost later. 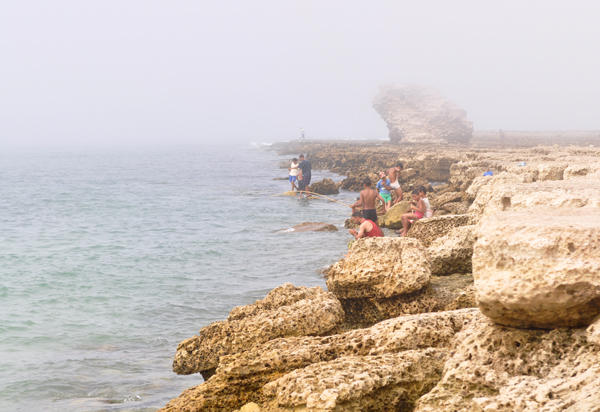 We knew that we had to be back in Oualidia because this place was very beautiful (even in the fog). We changed direction and went from the coast directly to Midelt because we heard about a new find of vanadynites that was waiting for us. And that was a good choice! In the next 3 days we made a short trip to Kerrouchene, but what was more important we had the possibility to underground several times and photograph superb pocket with really high quality bloody red vanadynites on white baryte! The pocket was elongated, tube shape. 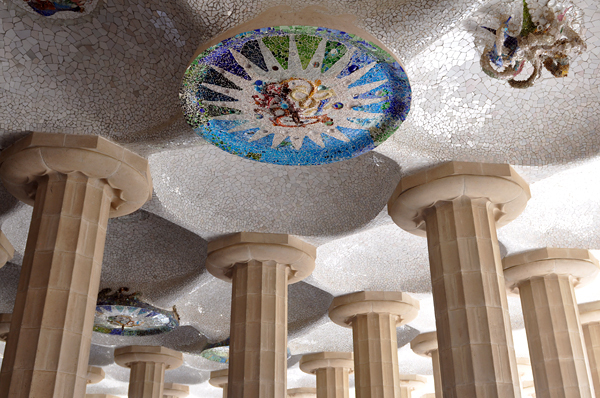 As usually the better quality crystals were located on the roof and on the walls. 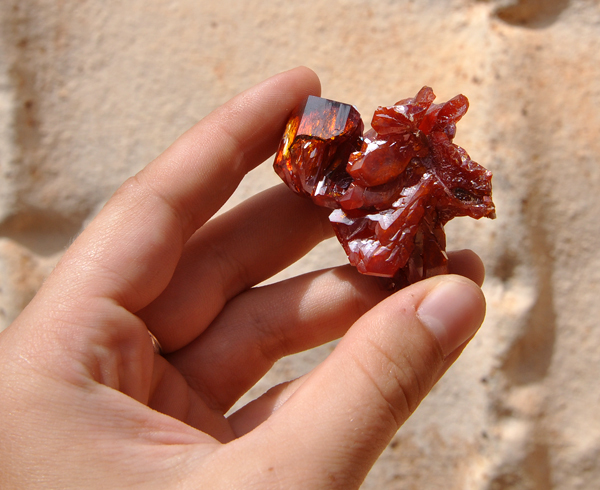 What was interesting color and forms of crystals changed inside the pocket at the distance of 30 cm – from bloody red to brown and yellow. This was really breathtaking experience. Photographing was very difficult with our huge camera with flash lamp in the tiny „rat holes“. Finally we had some nice pictures and all good specimens from the find including unusual, huge, curved, several centimeters big single crystals with great translucency! 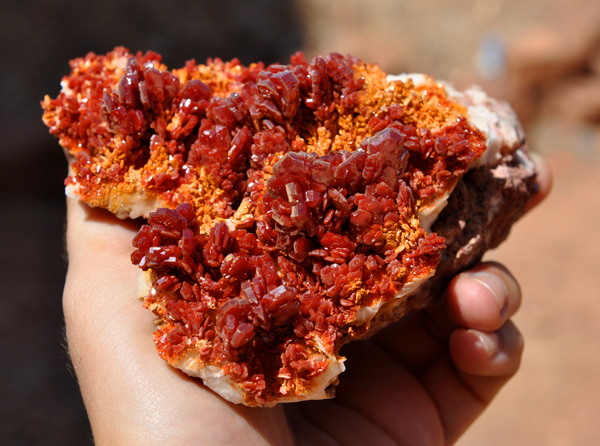 Other superb specimens were bloody red classic vanadynite crystals on white baryte. But it turned out that this was not all about vanadynites during our stay! 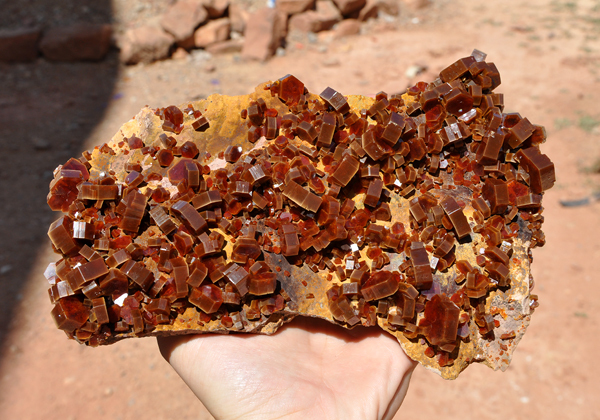 Another team working in the ACF mine in Mibladen found a pocket with unusual, huge, lustrous, extremely sharp vanadynite crystals, unfortunately in dark red to brown color. All of them are frosted at one side and lustrous on another. Size of crystals reach up to 3 cm and to 1 cm of thickness! Some specimens were really big (and very crazy priced) reaching over 40 cm! 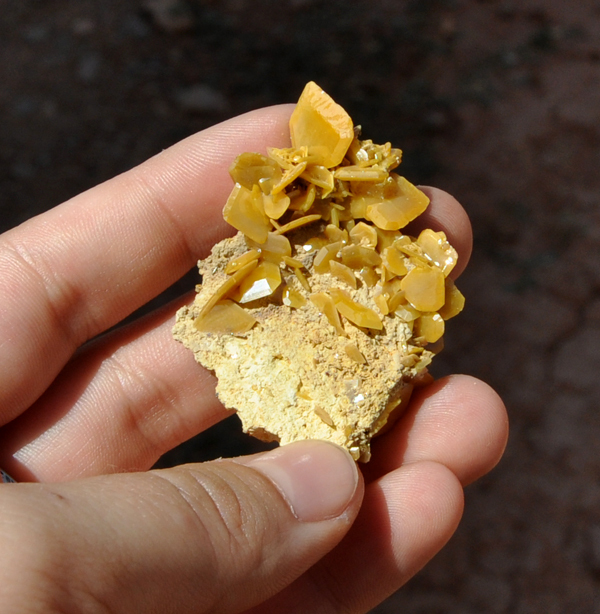 Probably the best from the find are hand size plates with scattered separated vanadynite crystals – very aesthetic. 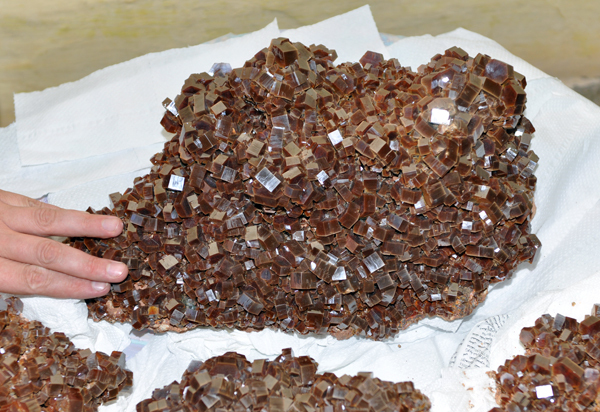 Third find of vanadynites that was discovered some time ago was not very spectacular but quite unusual – specimens from that find were big, parallely grown crystals in „tree shaped“ forms. A few of specimens from that find were quite good, including 15 cm specimen with spray of 6-7 cm high complex vadynite crystals. Another surprising find took place at Aderhoual area in Mibladen known previously only for not very high quality vanadynites. 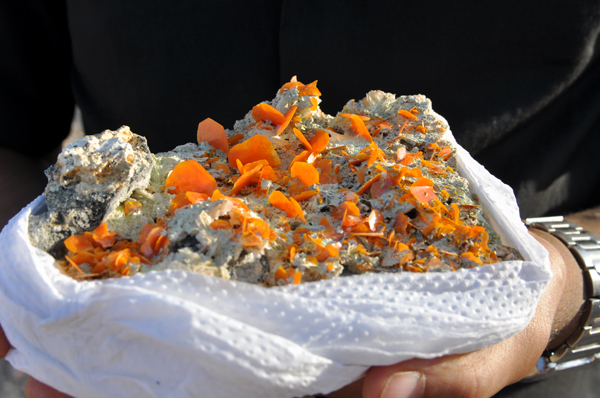 This time miners digging for galena ore found pocket with superb wulfenite crystals – very thin, translucent, yellow-orange tabular crystals up to 2.5 cm. Only a dozen specimens of good quality were collected from that pocket, but some of them are probably among the best ones known from Mibladen area! 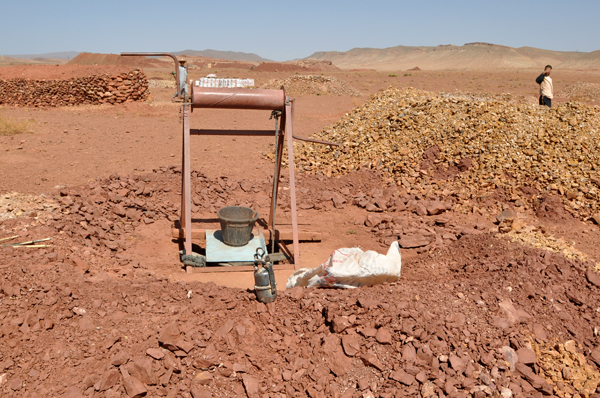 Beside of that we visited several dealers in Midelt but all of them told us that this was a bad time for minerals in Morocco – not too much had been produced recently. After spending great time in Mibladen we moved to Erfoud area stopping on our way to meet a friend from Imilchil who had some special specimens for us. 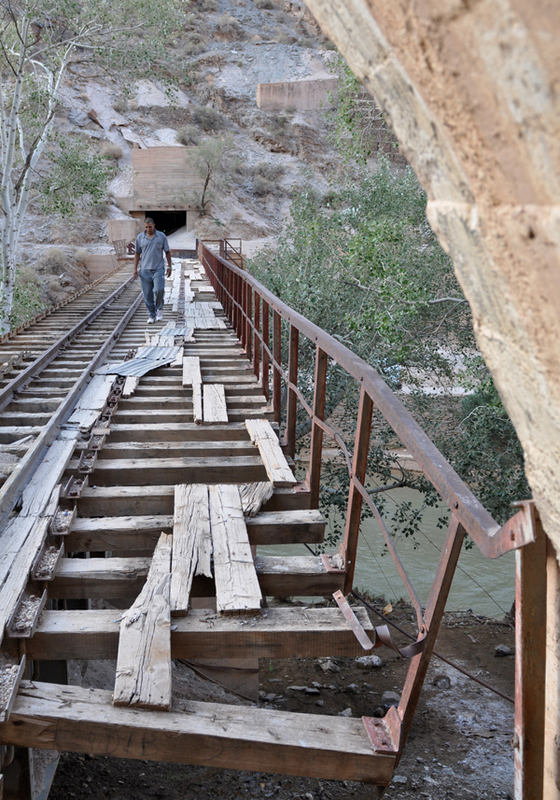 We didn’t have time to visit mines in Imilchil this time, but we will do it on our next trip for sure! 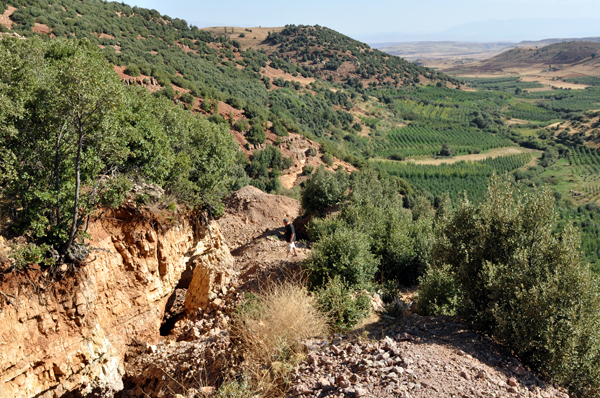 Three important finds were discovered in the Imilchil area in last months. First of all very unusual flat sheaf like forms of prehnite on dark matrix were found. Some of these specimens are very aesthetic because of the contrast and unusual form. Prehnite groups reach up to 6-7 cm. Also a big specimens of prehnite in more classic form were found. Second major find are big (as for this area) reaching 3 cm crystals of green titanite on feldspar matrix. They have good luster and good contrast with white/cream color feldspars. Last find, maybe not so good quality, but with big number of specimens in that area are quartz crystals in form of herkimer diamonds and also skeletal, window quartzs. 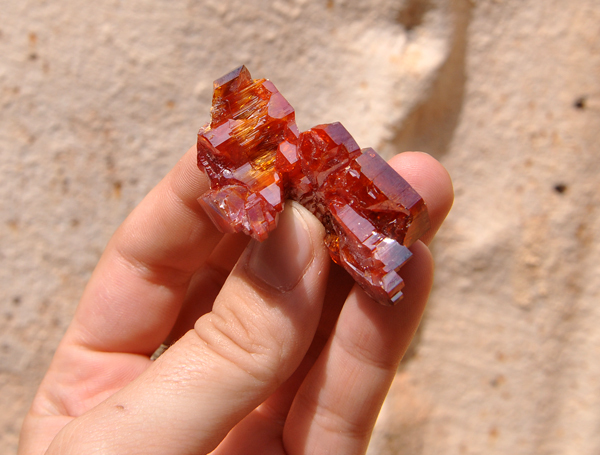 Size of specimens reach up to 10-15 cm, but usually single crystals are up to 5 cm. Probably in the nearest shows we will see a lot of these quartz specimens. Reaching Erfoud area we went to Erg Chebbi to our friend`s hotel where we spent night. I think it is worth to mention that temperatures at this time in Morocco, especially on the desert, reached over 40-45C in shadow! So, having AC in the room was really a pleasure, we also used swimming pool to cool down. Our real reason of visit there was the fact that participants of one of the trips of Mindat.org Conference will stay there for 2 nights. Next day we visited dealers specializing in Taouz and we found out that nothing interesting had been produced recentely. Our next stop was Aubergre Timbouctu owned by our friend Ben in Mcissi. He will help me to guide the field trips of Conference, so, we spend the whole day and most of the night discussing all details. 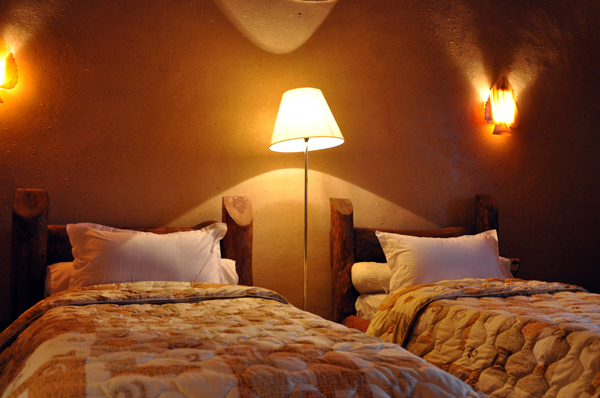 Next day we visited another hotels to select the best one for the trip in 2012. 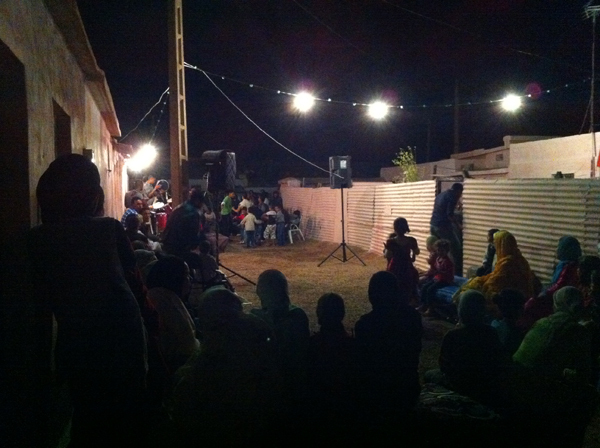 After that we drove to Agdez where our friends from Bou Azzer were already waiting for us. 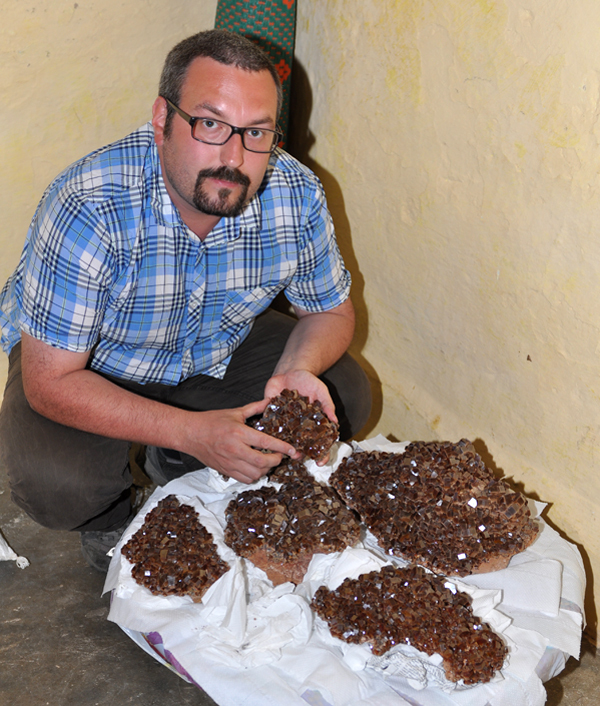 We spent the whole day in Bou Azzer selecting the minerals prepared for us. Again we didn’t have time to visit fields here as we usually do. There is several important news from the area. 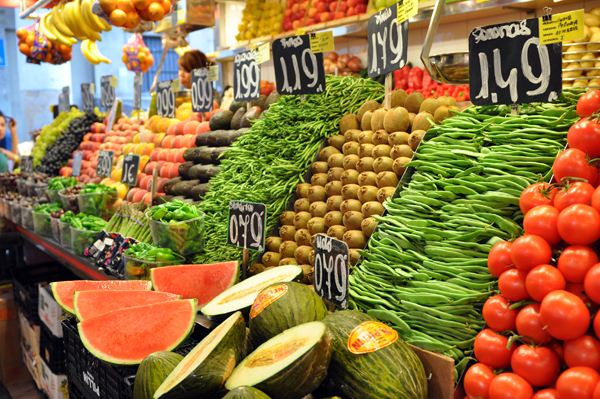 Most important one is a very long (many months) strike which made the production very slow. 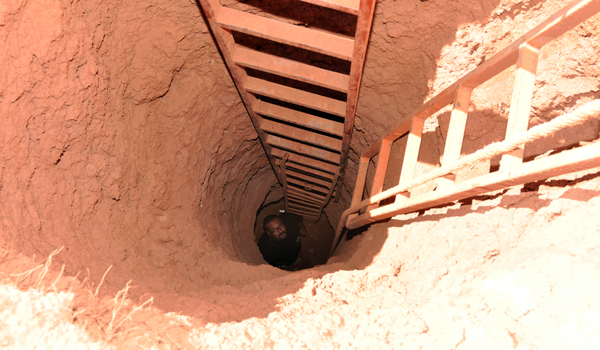 Problem is that miners have very low salary and also many of them have only temporary contracts, apart from that already 7 persons died this year in the accidents in the mines. 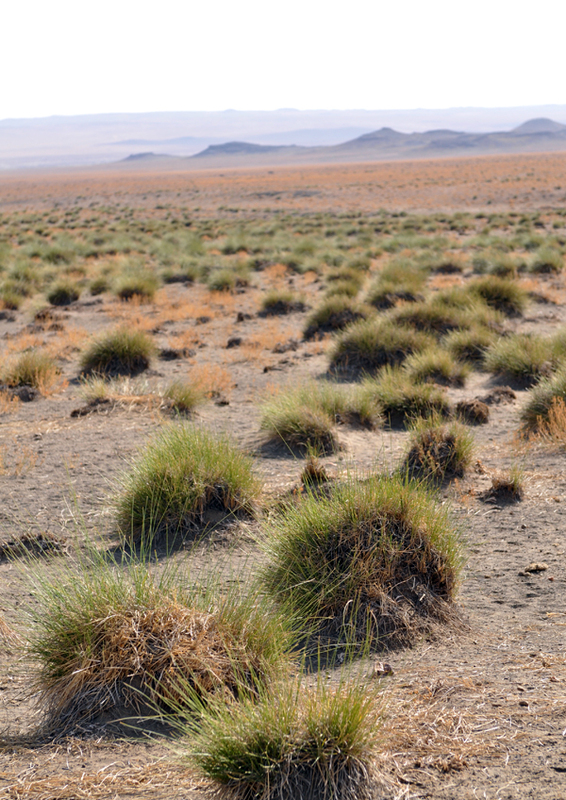 However even during the strike quite good number of specimens was produced. 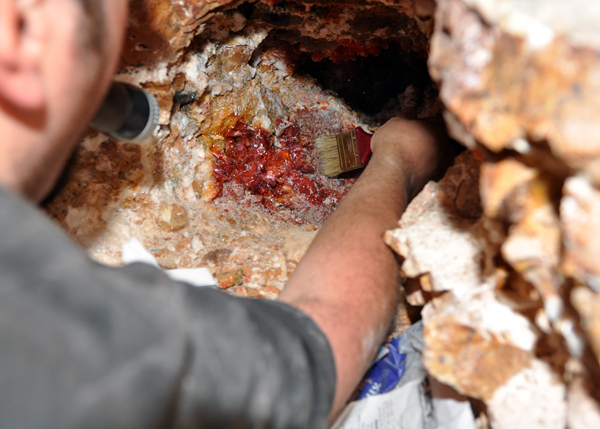 There is not much erythrites from Shaft 1 but they appear now in the Taruni mine that was quiet for long time. The new erytrites have very good luster, crystals up to 3 cm, some are doubly terminated, forming frequently floater specimens. Overall quality is not superb yet, but quite promising. 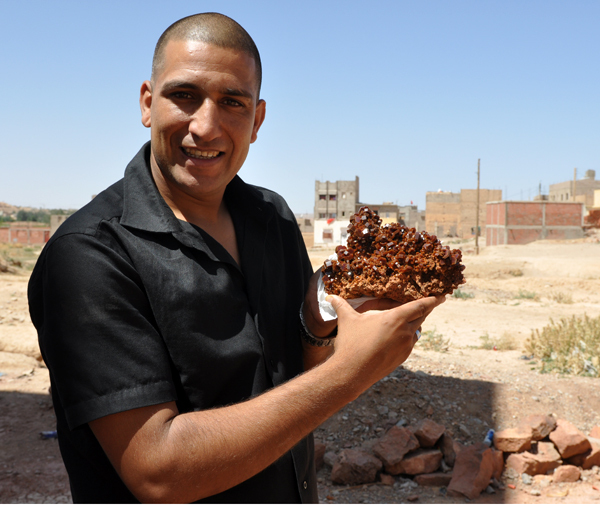 Mine Bouismas stopped producing skutterudites but in the same time they appeared in Aghbar mine and are even better than the previous ones! They are very lustrous, form sharp, big crystals, sometimes in association with chalcopyrite. 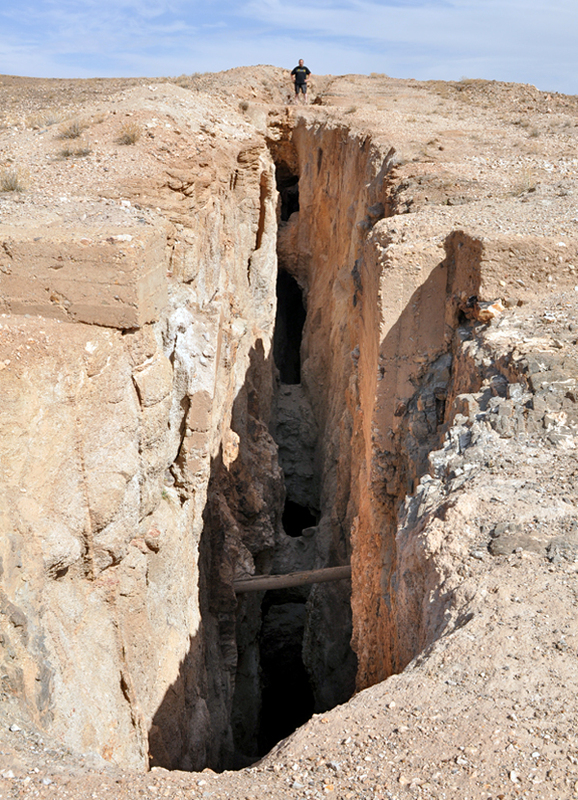 Agoudal mine produced cobalctocalcites but in small quantities , but an important find of Co-dolomite took place there. Specimens reach up to 20 cm and are covered by dolomite rhombohedrons in pink color up to 1 cm big. 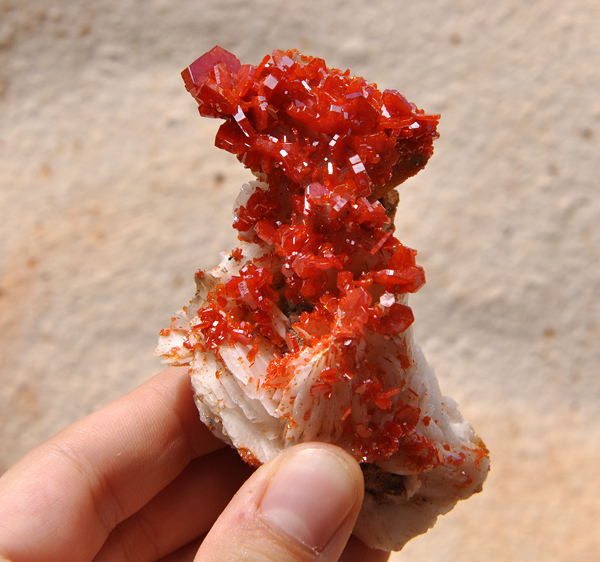 Aghbar mine still produces good roselite specimens. 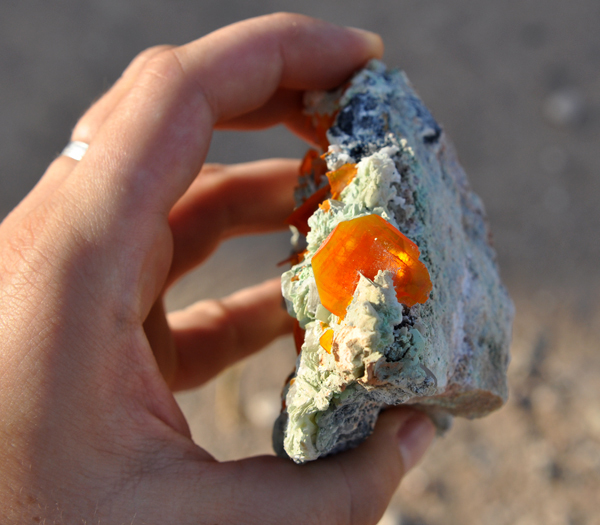 Small find of calcite crystals heavily included by neon-green conichalcite was also done there. Crystals are small, up to a few mm, but specimens are very attractive. 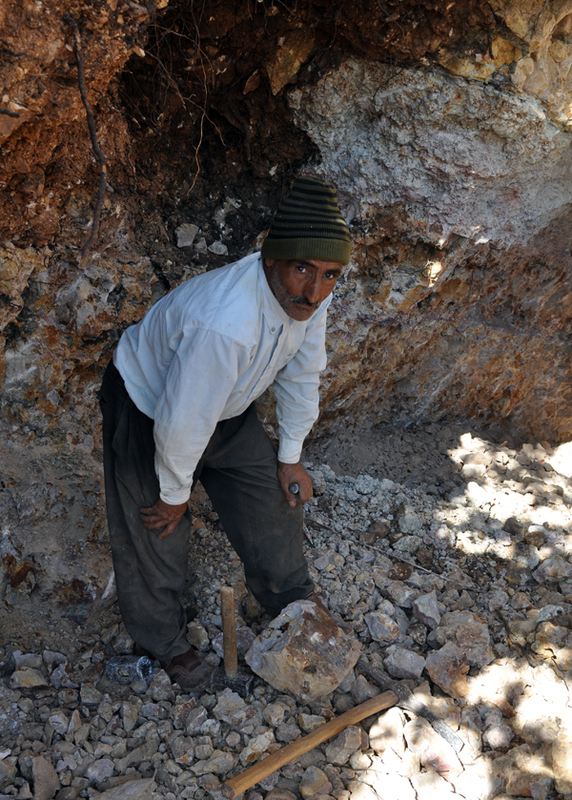 There was an important find of „spongy“ native silvers in Bouismas mine. Some of the specimens are over 20 cm! They are all frozen in calcite and have to be etched. Also some minor proustites appeared after long time of absence in this mine. All together our car was quite full of boxes and specimens including 30kg specimen of skutterudite! We spent that night in Taznakht, starting to go back to the coast. 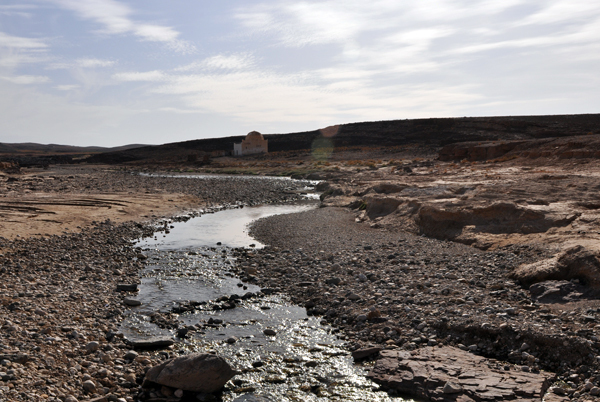 Next day we drove to the scenic Tafraout – famous touristic spot. This area is build by red granites forming high, spectacular, rounded mountains. Not far from Tafraout there is located a famous artistic performance – huge granite boulders were completely painted in different colors. Interesting and funny place. 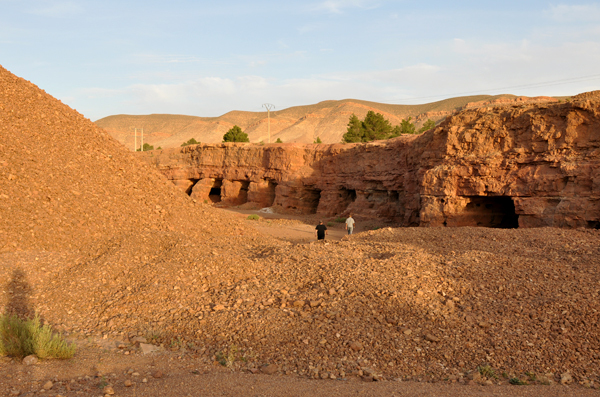 We visitef also a famous picturesque gorge Ait Mansur that is located in the vicinity of Tafraout. Small villages surrounded by date palms in dry and monumental mountains create a typical view for this area. 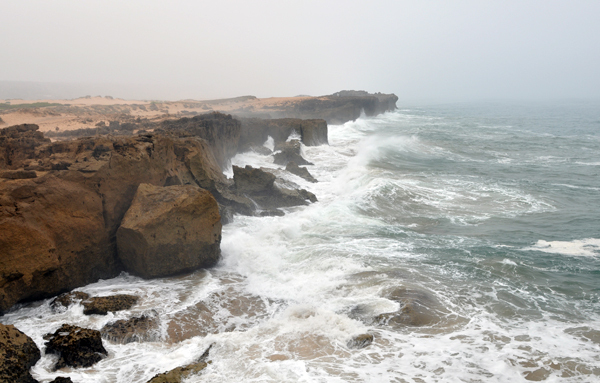 After visiting all this places we drove to Sidi Ifni situated far on the southern part of Atlantic coast. 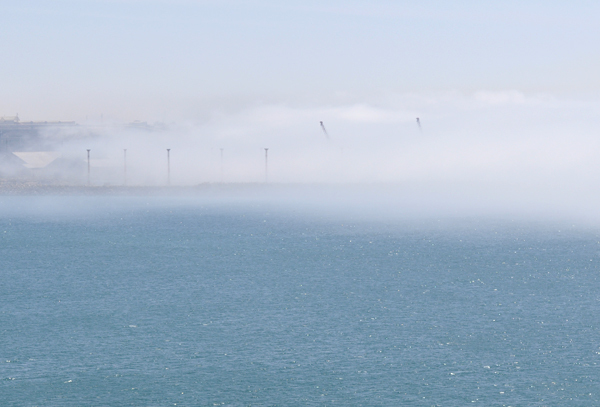 We arrived by night and were very curious if we would see the fog in the morning, fortunately the air was very clear. 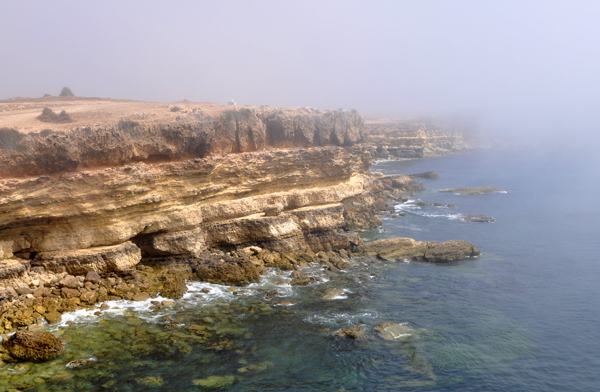 Sidi Ifni is well known for incredible, huge rock formations stretching from cliff to the ocean forming big arches. From a distance they are not so impressive but when you are in the opening of an arch than you realize how big it is! 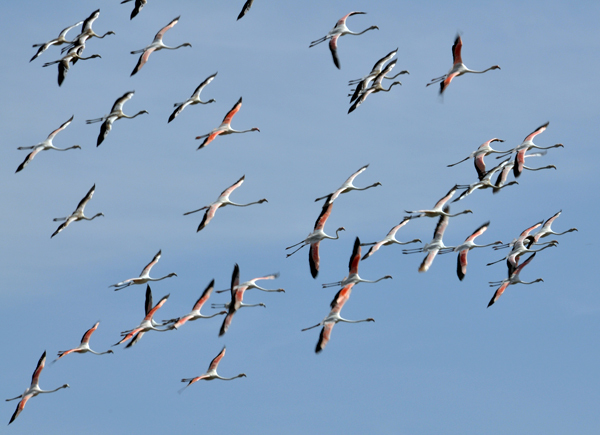 We spent there a great morning and later went north - to Essouira. 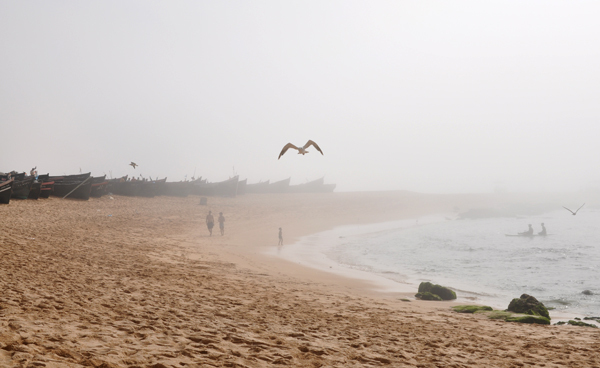 Essaouira turned out to be just fantastic. 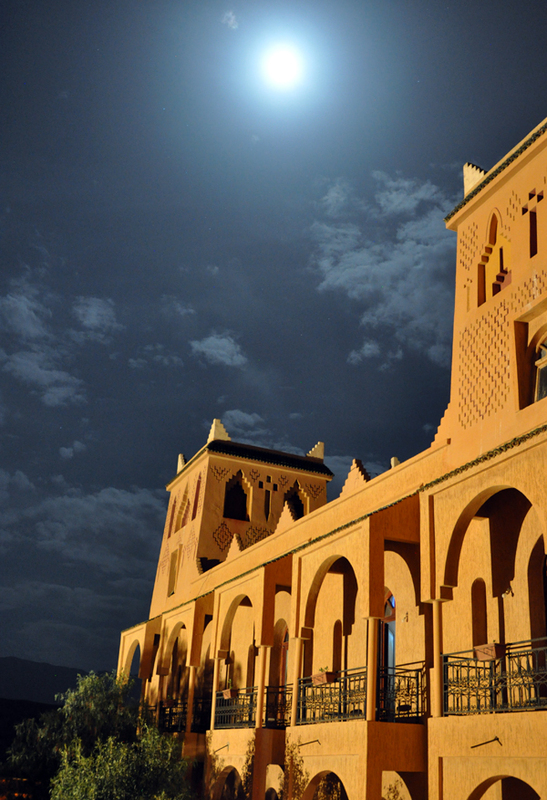 It is surely among the most beautiful and charming cities in Morocco with a very pleasant atmosphere, and what is more, it is situated on the coast! The old part of the town is all painted in white so it makes a very nice picture with the blue ocean, especially that there are also white seagulls everywhere – there are thousands of them!. It is not surprising concerning how much food they can find in the harbour – the fish market looked amazing – we have never seen so many types of see creatures on such a limited space. 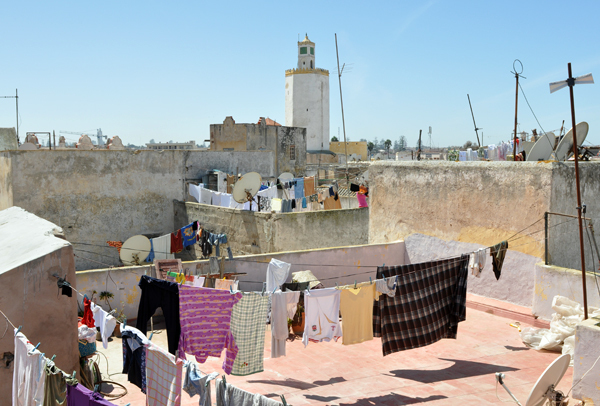 We liked Essouira so much that we stayed an extra day there. 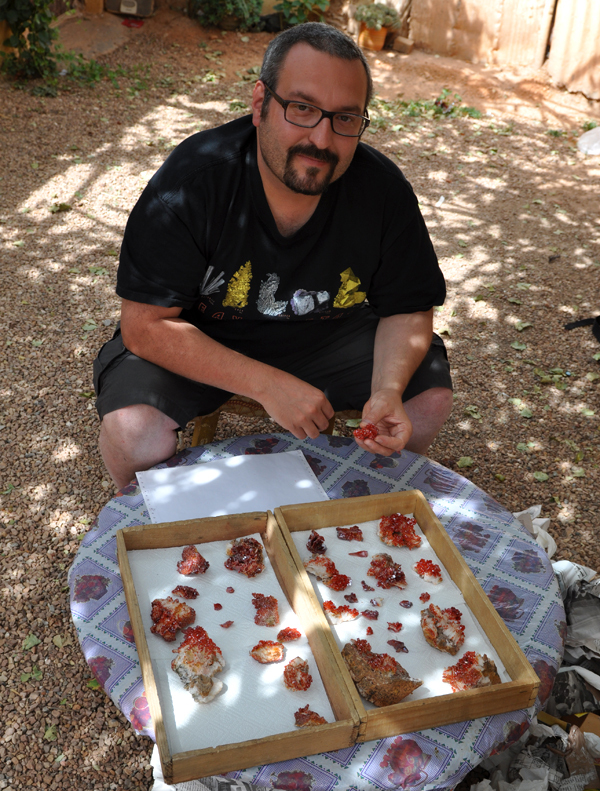 On the way from Essouira to Casablanca we visited Ighoud – locality which produced many specimens until early 2000’s. Number of baryte veins and karstic deposits had been exploited in tens of quarries and small mines on a huge hill for 50 years. Mineralized zones are very reach in pockets filled with calcite, baryte and quartz. Recently everything is corroded on the surface and all mines are closed. Pretty much this is a historic locality. In earlier days it was famous especially for Cumberland like specimens – barytes, hematites, calcites and short quartz specimens. Today the local people mine karstic zone very reach with stalactitic forms of calcite only in one place. Specimens from there have sometimes crystals which are quite big, but usually heavily etched and rounded. Majority of this material is what Moroccan dealers sell in wholesale flats. From Ighoud we went back to Oualidia to see this place again in sun. It looked very different and as we expected it was worth to come back. Huge waves were crushing on the sharp rocks of the cliff. 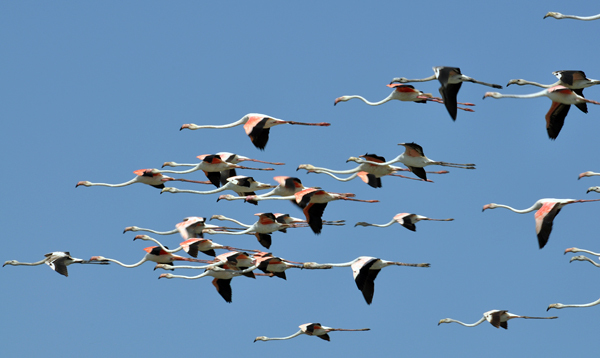 Really great spectacle of the Mother Nature! Our last stop was in the airport hotel in Casablanca were our friends came to pick up minerals which we bought during the trip. After a great evening, next day early morning, we flew directly to Warsaw. 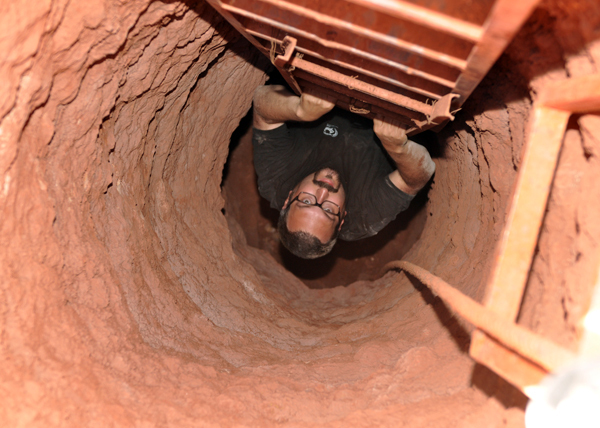 One thing is sure – this is not our last trip to Morocco this year! 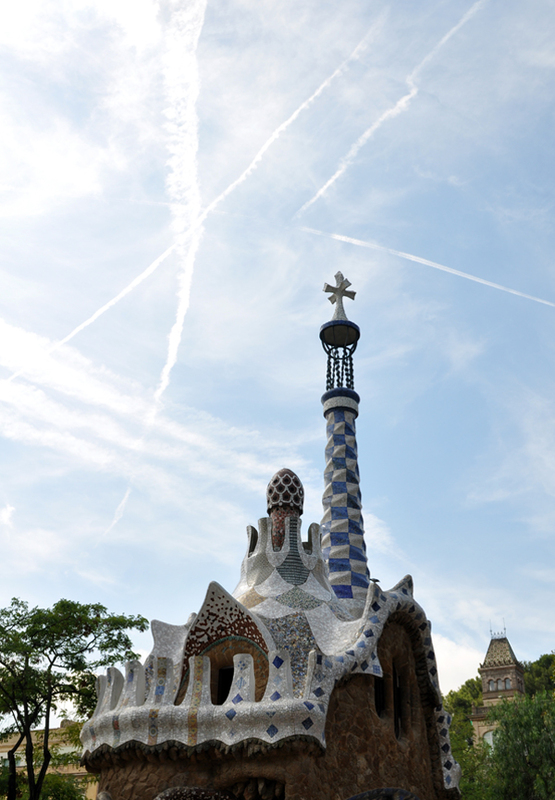 This time we decided to go to Morocco through Barcelona where we spent 2 days. Google maps. 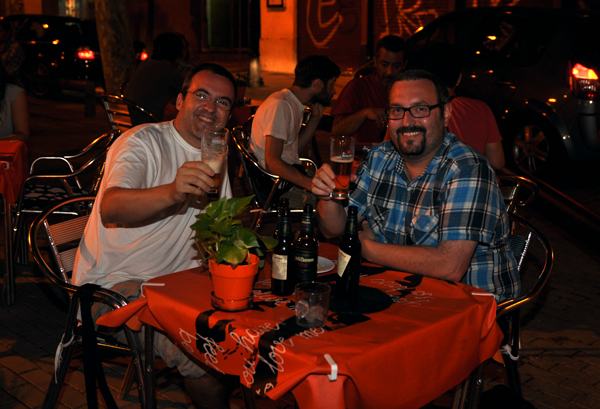 We came to Barcelona late and made the first tour the same night. 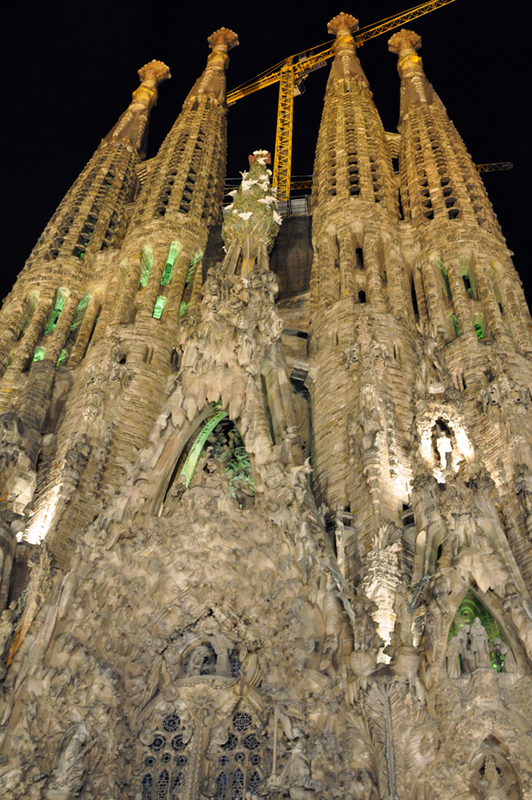 The incredible Sagrada Familia by night, Barcelona. J. Gajowniczek photo. 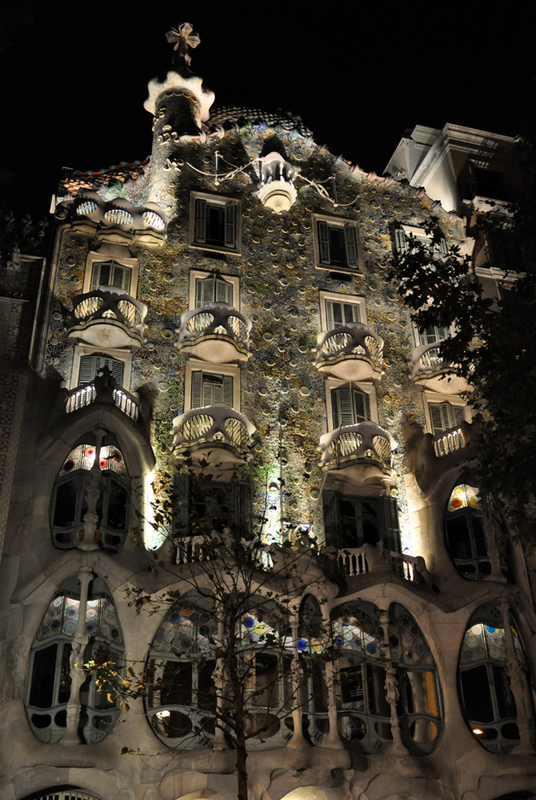 Casa Batllo - a famous Gaudi`s building by night, Barcelona. J. Gajowniczek photo. 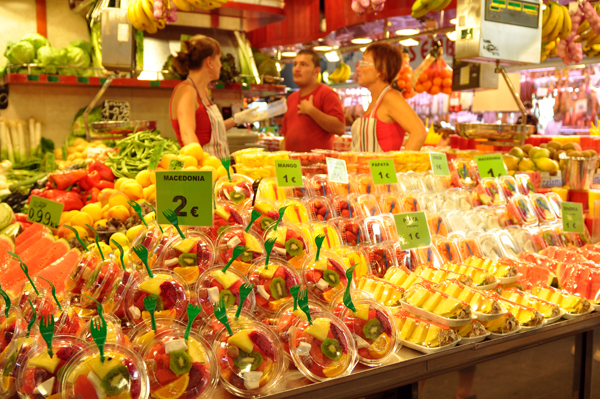 The very colorful market near Rambla street, Barcelona. J. Gajowniczek photo. 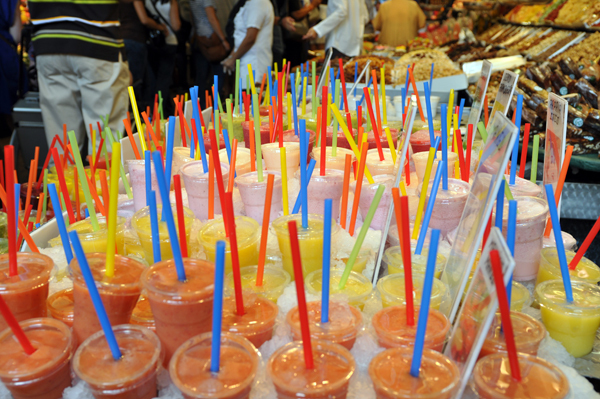 The very colorful market near Rambla street - a boundless choice of juices` tastes, Barcelona. J. Gajowniczek photo. 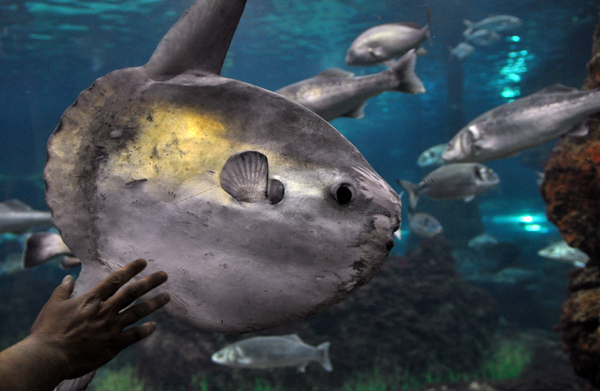 We visited also the oceanarium in Barcelona. J. Gajowniczek photo. 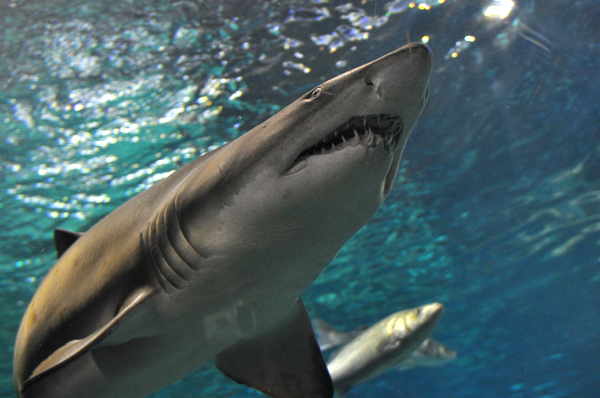 Shark in Aquarium Barcelona. J. Gajowniczek photo. 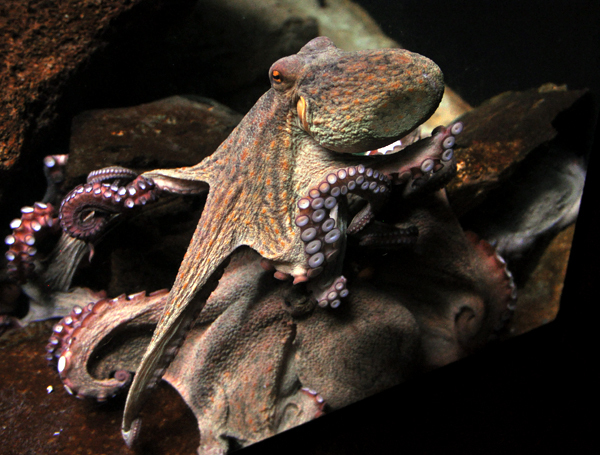 Octopuses, Aquarium Barcelona. J. Gajowniczek photo. 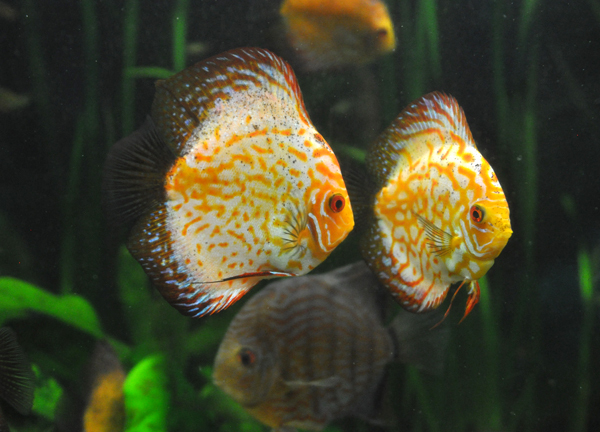 South America`s freshwater fish, Aquarium Barcelona. J. Gajowniczek photo. 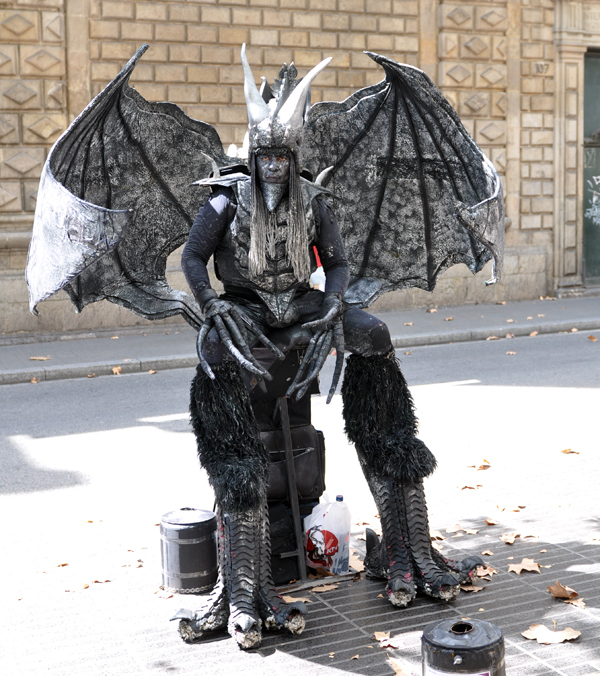 Rambla - you can find a lot of interesting performers there. J. Gajowniczek photo. 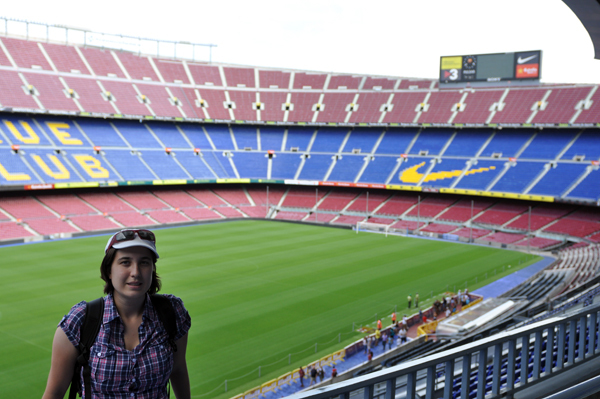 Asia is a big fan of football and a player, so we had to viist Camp Nou! The stadium of FB Barcelona. T. Praszkier. 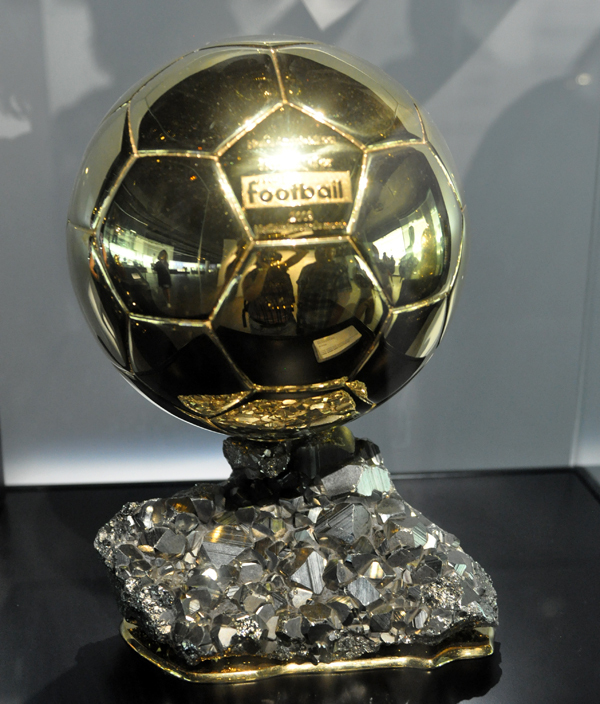 The replica of the Golden Ball given to L. Messi in 2008 - note the base made of Peruvian pyrite, Camp Nou Museum. J. Gajowniczek photo. 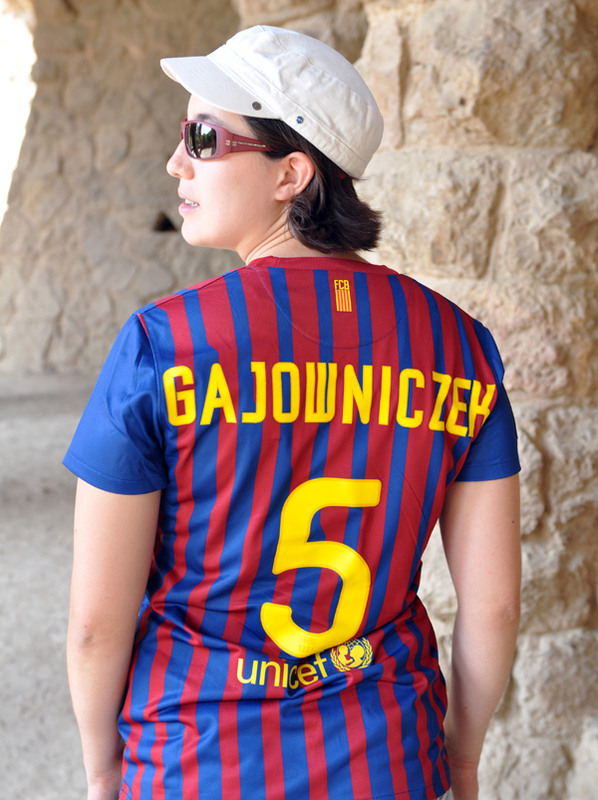 The new player in FC Barcelona, no 5 – Gajowniczek! T. Praszkier photo. 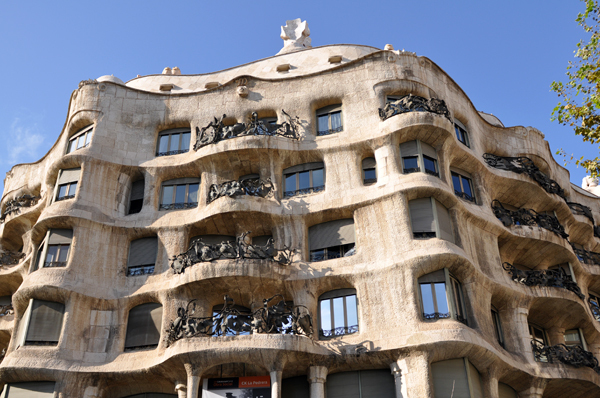 Casa Mila - the other famous Gaudi`s building, Barcelona. J. Gajowniczek photo. 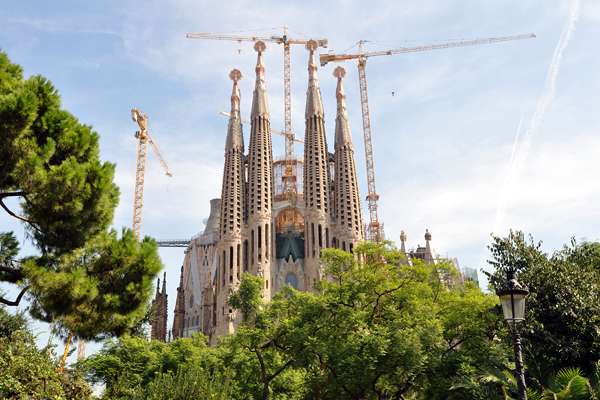 Sagrada Familia - this time in the day light. It has been under construction since 1882! J. Gajowniczek photo. 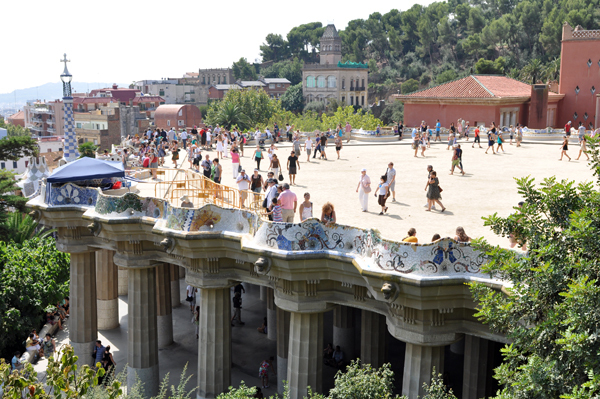 Parc Guell - designed by Gaudi, Barcelona. J. Gajowniczek photo. 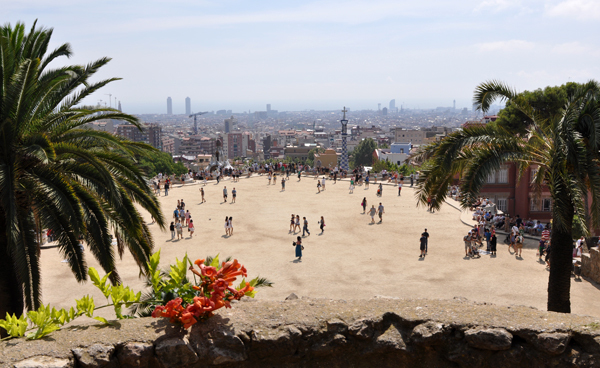 Parc Guell - with view to Barcelona. J. Gajowniczek photo. Tom and Joan Rosell Riba (Catalan mineral dealer) who showed us some part of his city (Thank you!). J. Gajowniczek photo. From Barcelona we flew to Casablanca. Google maps. From the airport we drove directly to El Jadida to see the moroccan coast. Google maps. 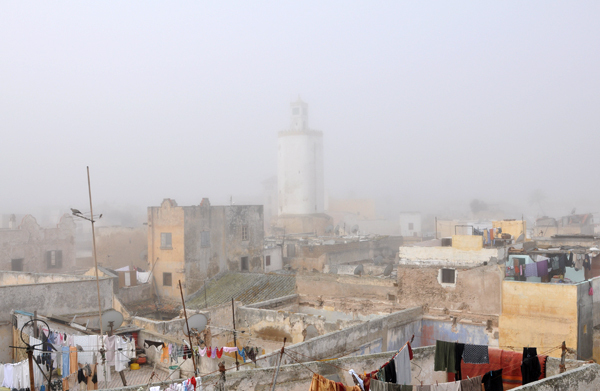 El Jadida in the thick fog. J. Gajowniczek photo. And the same view after the mist dissapeared. J. Gajowniczek photo. 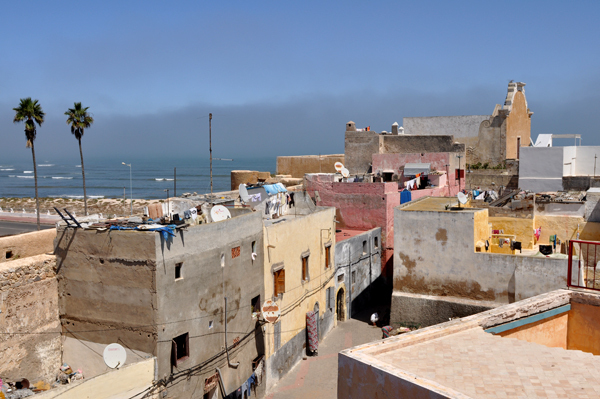 Portuguese Fortified City of Mazagan (the previous name of El Jadida). J. Gajowniczek photo. 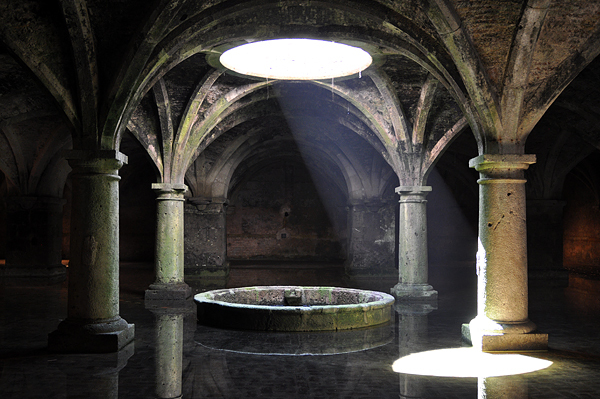 Manueline cistern of the El Jadida fortress.. J. Gajowniczek photo. Children fishing - on the road to Oualidia. J. Gajowniczek photo. 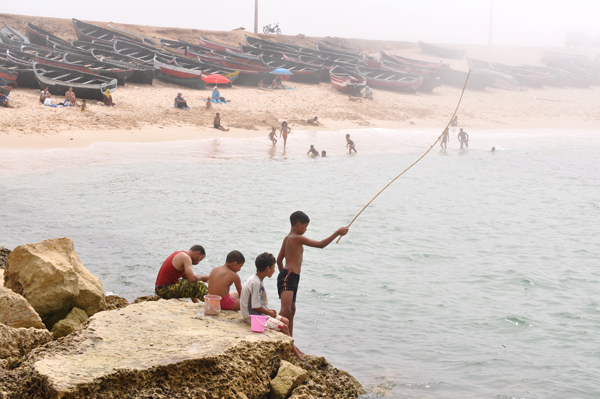 Children fishing and playing in the cold ocean - on the road to Oualidia. J. Gajowniczek photo. The fog was everywhere on our road. J. Gajowniczek photo. A huge port industrial construcions in the fog on the road to Oualidia. J. Gajowniczek photo. 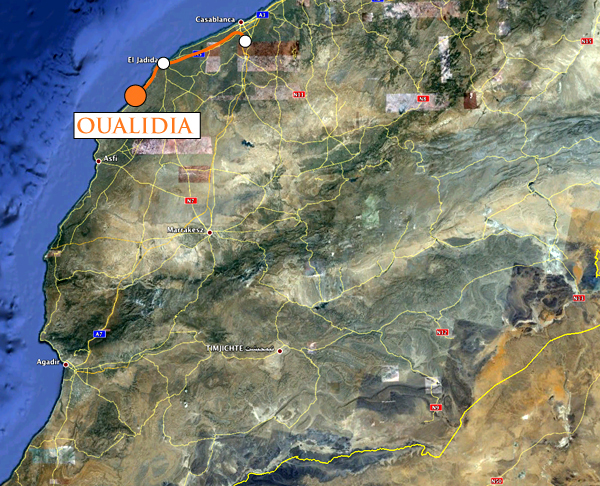 We arrived to Oualidia in the afternoon. Google maps. 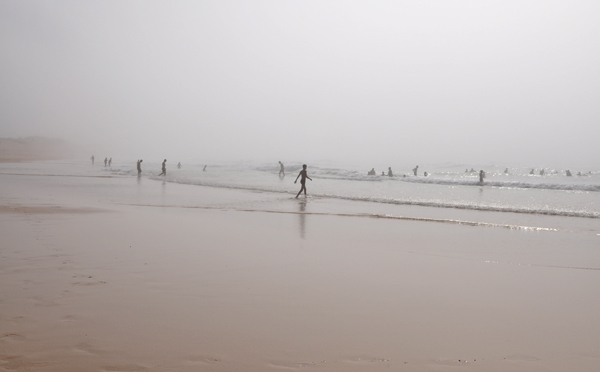 Holiday resort popular among Moroccans - Oualidia - again in a thick fog. Oualidia is famous for oysters, the umbrellas and tables are the small seafood restaurants on the beach. J. Gajowniczek photo. 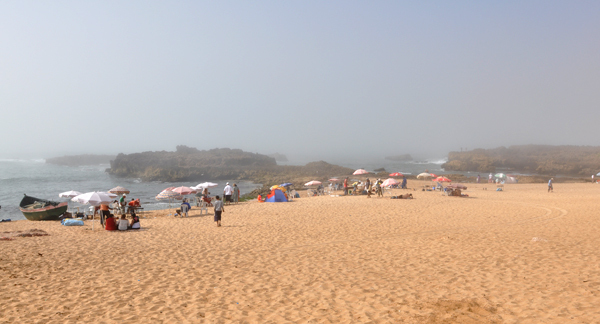 Holiday resort popular among Moroccans - Oualidia - again in a thick fog. J. Gajowniczek photo. Swimming in the fog. J. Gajowniczek photo. 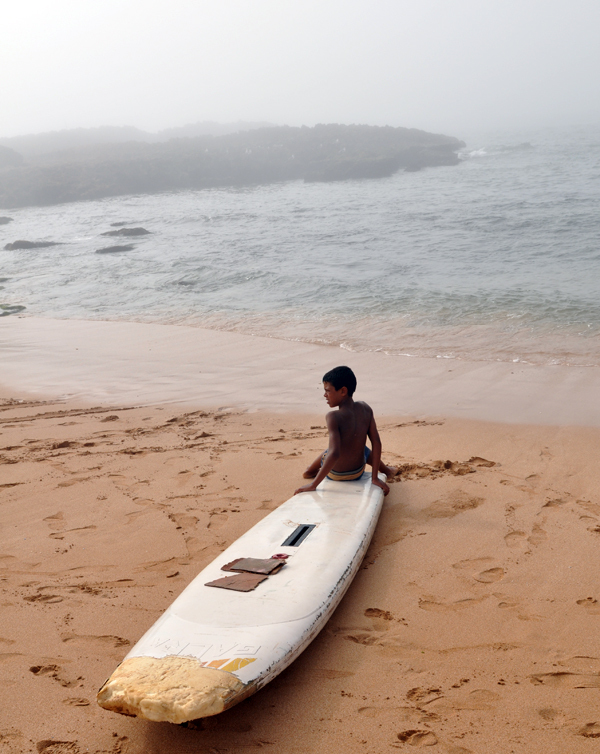 The coast of Morocco is known amont surfers, Oualidia. J. Gajowniczek photo. 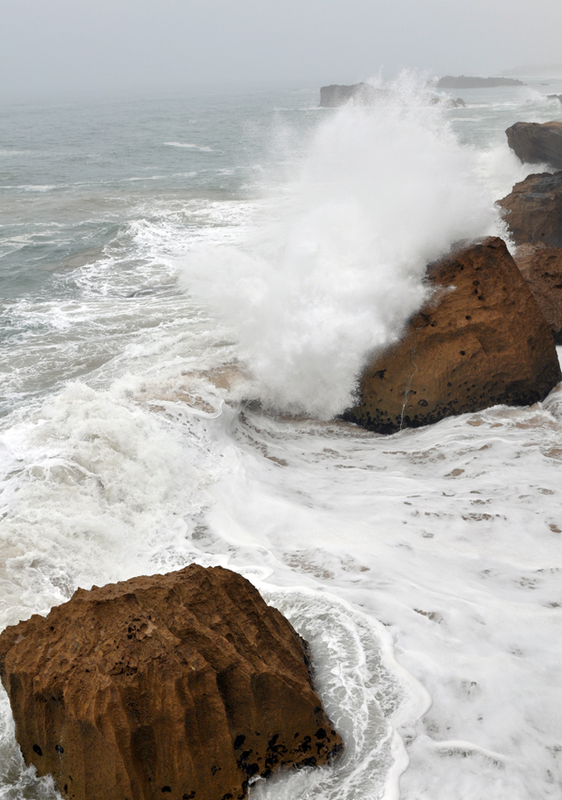 The ocean was very disturbed while we were there - the foamy waves looked beaulifully crushing on the cliffs, Oualidia. J. Gajowniczek photo. 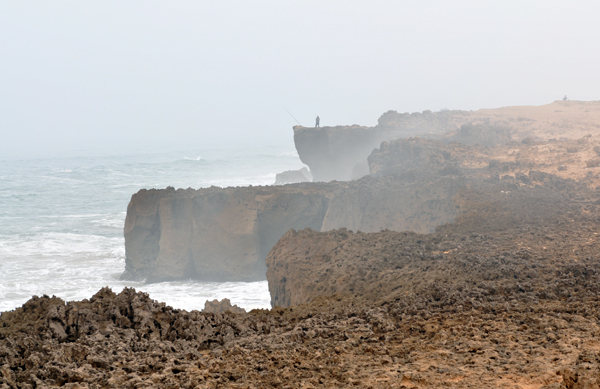 Oualidia`s cliffs. J. Gajowniczek photo. Even though the ubiquitous mist created a very interesting atmosphere we decided to change our plans and visit the coast later when (hopefully) the sun will come back there again - so we set off to Midelt. Google maps. 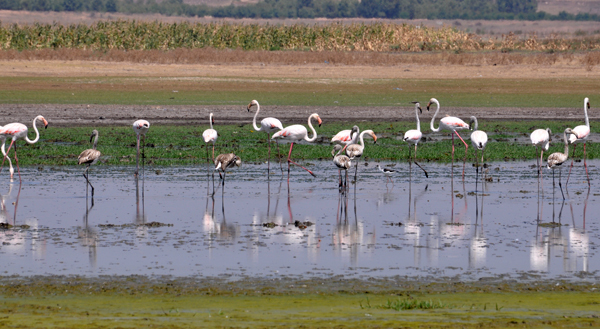 The flamingos by the road. J. Gajowniczek photo. We arrived to Midelt by night. The view from our hotel window. J. Gajowniczek photo. Mohammed Laaroussi from Midelt who is our very good friend and part of Spirifer family – we spent with him a lot of time! J. Gajowniczek photo. 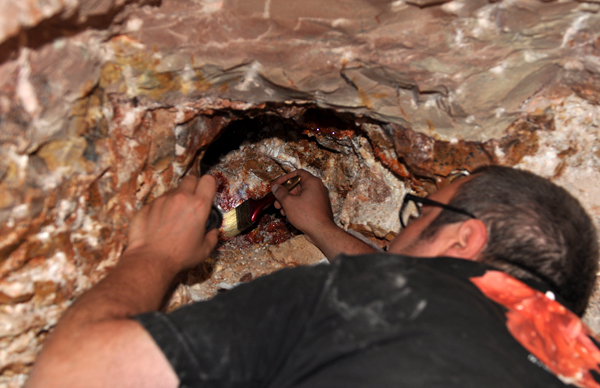 We were very happy to visit working with a freshly opened geode!, Mibladen. J. Gajowniczek photo. Tom at the bottom of the working. J. Gajowniczek photo. A freshly opened geode with very good color, lustrus vanadinites and baryte (note the ring inside the geode for scale). J. Gajowniczek photo. 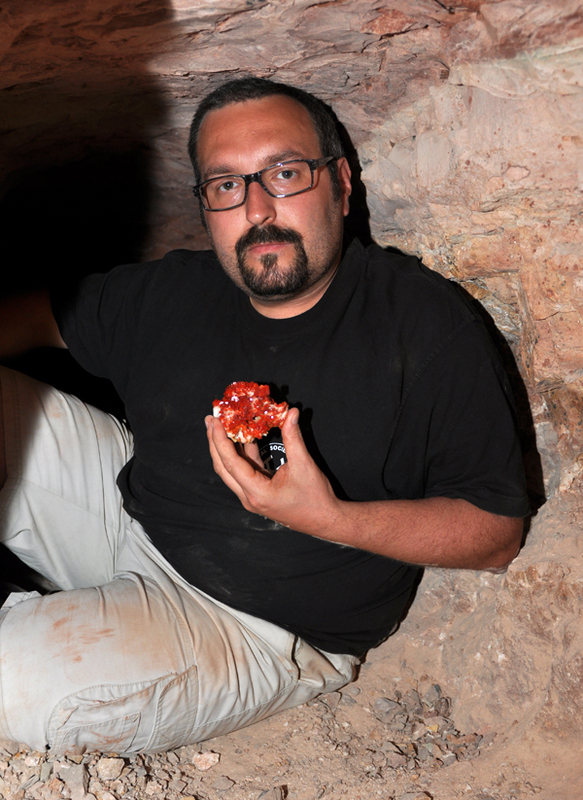 Tom underground with a blood red vanadinite on baryte that just left the geode. J. Gajowniczek photo. 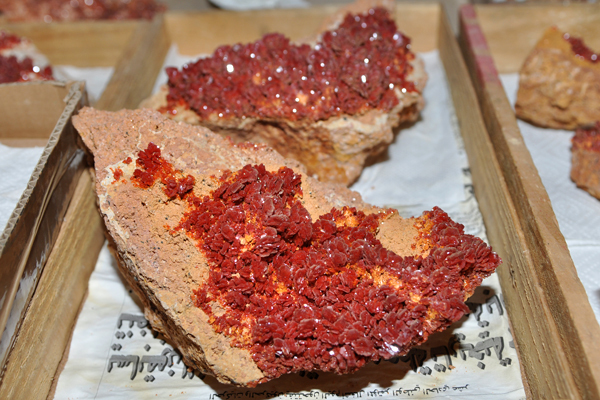 The same vanadinite from the picture above with two other very unusual specimens. J. Gajowniczek photo. 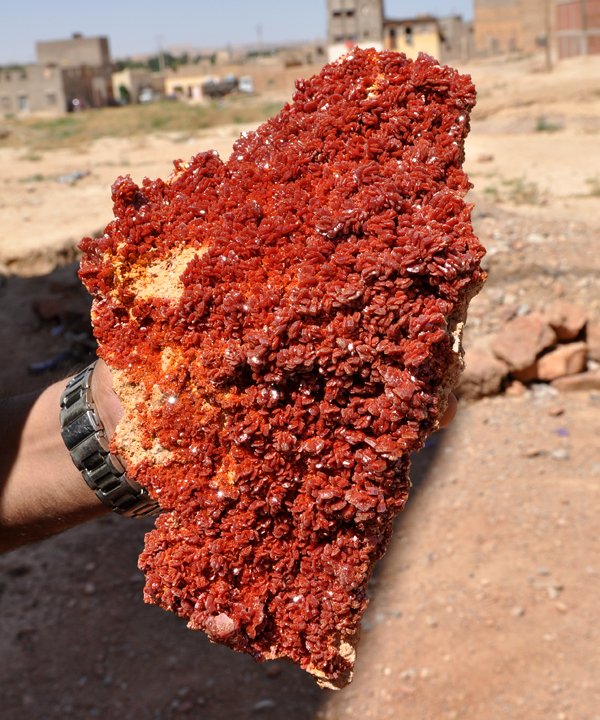 An unusual, huge, curved, top color vanadinite crystal. J. Gajowniczek photo. Dirty Tom coming back to the surface, Mibladen. J. Gajowniczek photo. 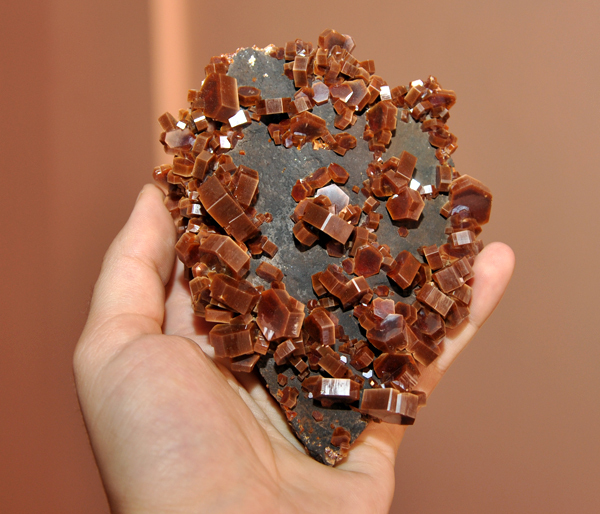 The specimen from one of the photos above, very lustrus, unusually shaped vanadinite. J. Gajowniczek photo. And another - also very interestingly crystallized specimen. J. Gajowniczek photo. 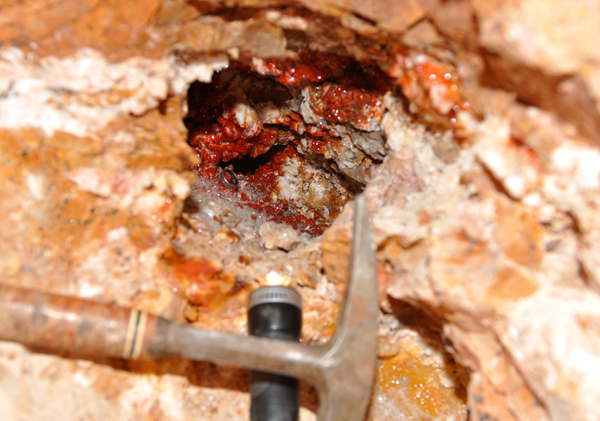 One of the vanadinites from the same find, note the very red color. J. Gajowniczek photo. 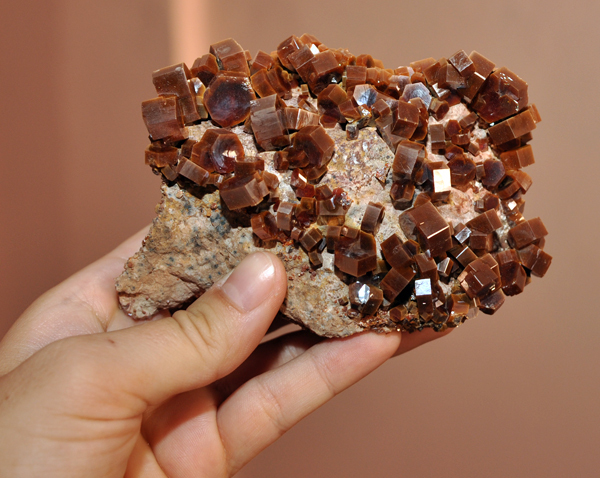 Vanadinite on baryte from the same find. J. Gajowniczek photo. 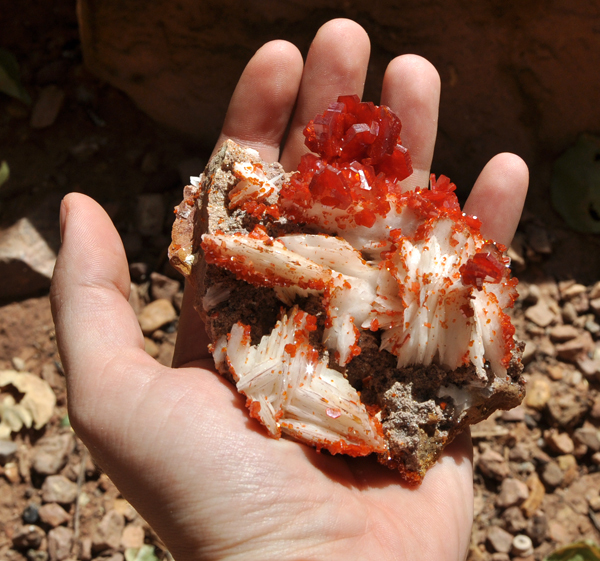 We made a trip to Aouli, Sidi Ayed and a calcite locality without name the next day. 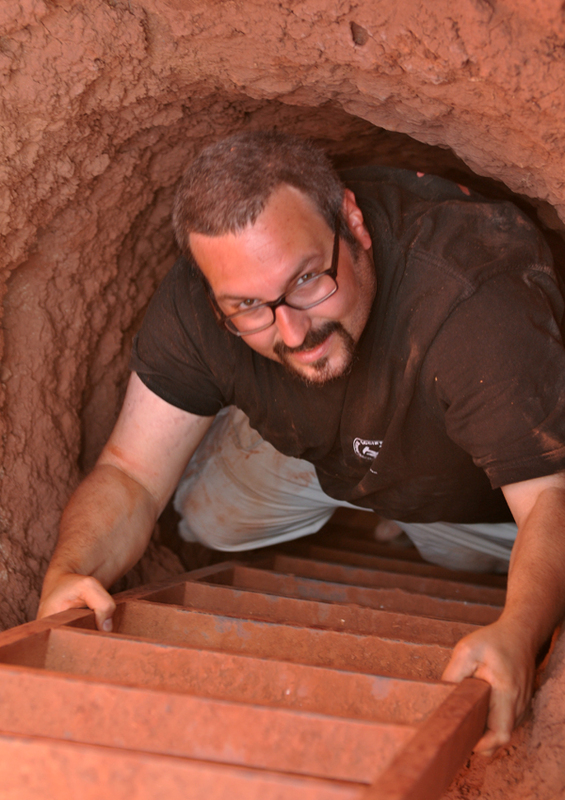 In the old entrance to the Aouli Mine. J. Gajowniczek photo. Tomb of a man called Sidi Ayed - from whom the village of Sidi Ayed took its name. J. Gajowniczek photo. 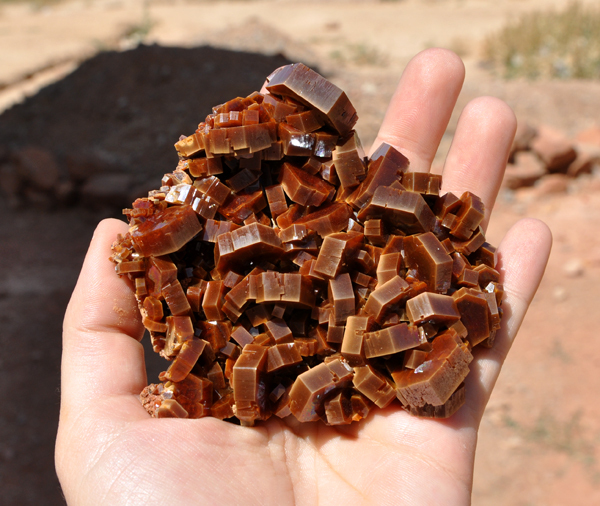 Sidi Ayed Mine famous for fluorites, malachites and azurites. J. Gajowniczek photo. 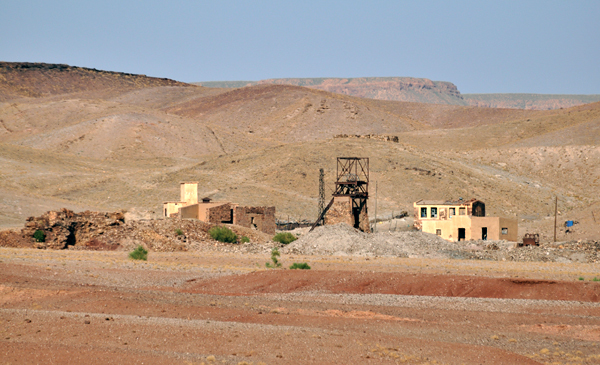 Workings in Sidi Ayed. J. Gajowniczek photo. 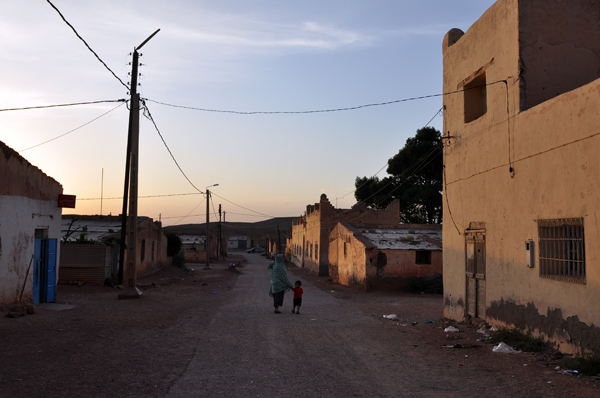 Around Sidi Ayed. J. Gajowniczek photo. 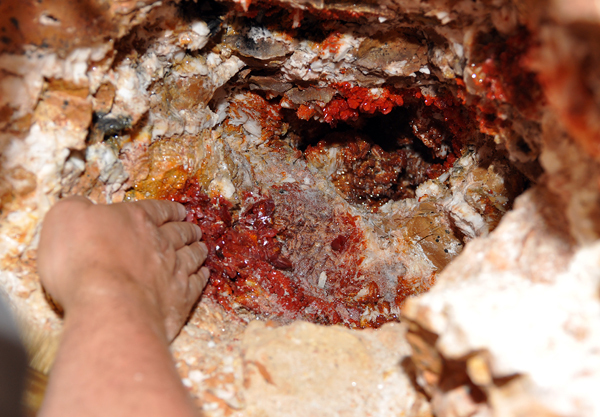 After the trip to Sidi Ayed we returned to Mibladen to see the same geode once again - this time it was opened more widely. J. Gajowniczek photo. Very happy Tom going dow to the working. J. Gajowniczek photo. Tom (in a very uncomfortable position) preparing the geode for photography. J. Gajowniczek photo. 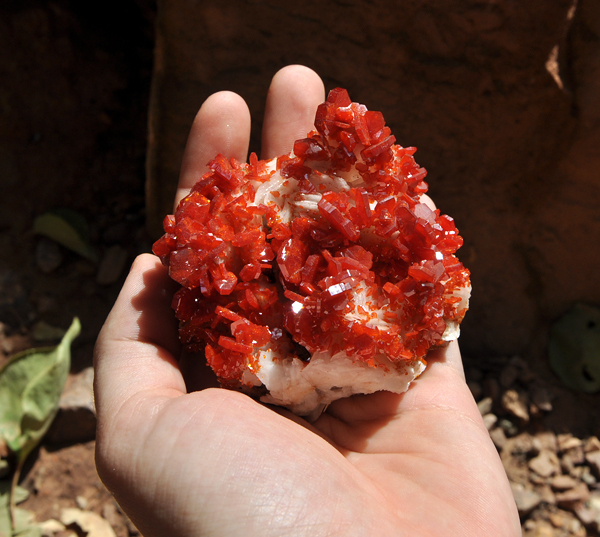 A pocket with incredibly red, superb specimens on baryte. Tom was very unhappy he could not collect there too much. J. Gajowniczek photo. Tom examining specimens from the geode above. J. Gajowniczek photo. A blood-red specimen. J. Gajowniczek photo. One of the best specimens from the find. J. Gajowniczek photo. Big, lustrus crystals on baryte matrix. J. Gajowniczek photo. We spent some great time with Mohamed`s family who is always extremely hospitable to us. J. Gajowniczek photo. Another day we spend in Mibladen area. Les O workings - some of cerussites and wulfenites come from here. J. Gajowniczek photo. Than we went to Mibladen village. Children going back from school. J. Gajowniczek photo. Second of the recent vanadinites` find, the crystals are huge and very well developed, the only flaw is their color - they are brownish red. J. Gajowniczek photo. Note the size and thickness of crystals. J. Gajowniczek photo. Some of the specimens have crystals scattered on a dark matrix which makes a very aesthetic contrast J. Gajowniczek photo. A nice specimen with very well individualized crystals and contrastive matrix. J. Gajowniczek photo. A big specimen with quite good color as for this find. J. Gajowniczek photo. 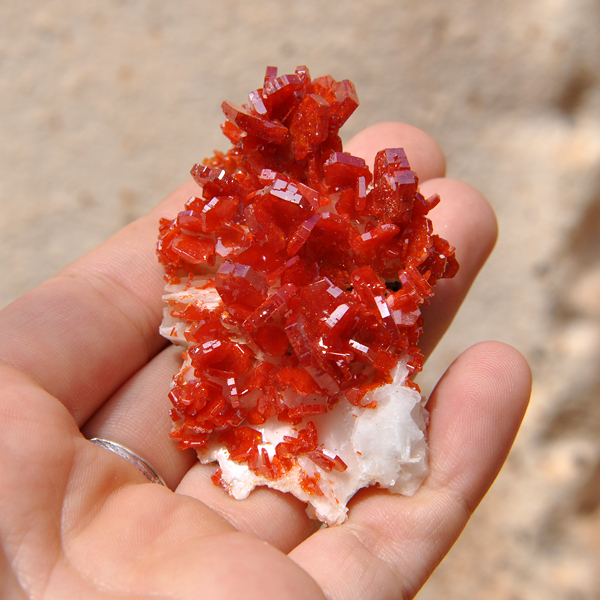 Huge and extremely thick crystals - what a pity they are not blood-red!. J. Gajowniczek photo. Some of specimens from that find were giant. J. Gajowniczek photo. 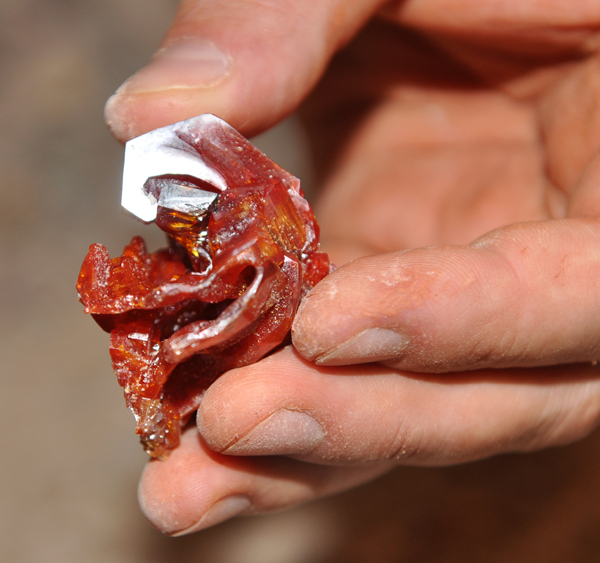 And the third recent find of vanadinites - tree-like, red, rather small crystals. J. Gajowniczek photo. 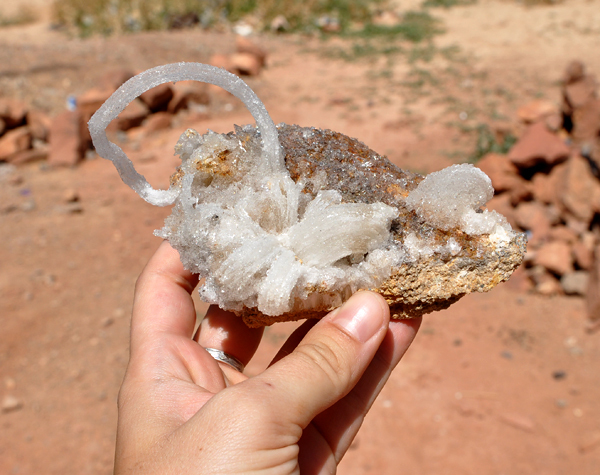 The crystals are not big but have quite interesting forms. J. Gajowniczek photo. Some of the specimens from this find are very big. J. Gajowniczek photo. We were invited to the wedding of friend from Mibladen - it was our first Arabic wedding and a very interesting experience. J. Gajowniczek photo. The next day we made a trip to Kerrouchen. J. Gajowniczek photo. Tomek in the Kerrouchen workings. J. Gajowniczek photo. One of the locals looking for azurites and malachites, we were wondering why a lot of people there wore winter hats in 40C, Kerrouchen. J. Gajowniczek photo. 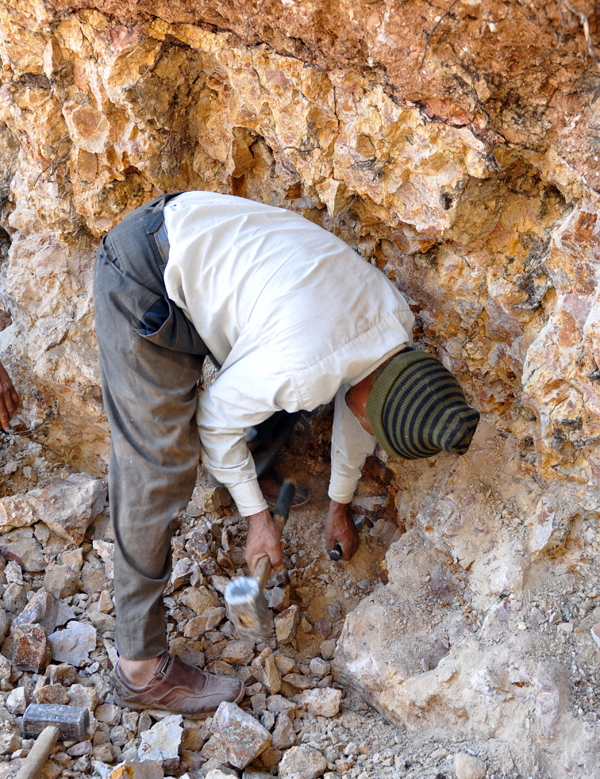 One of the locals looking for azurites and malachites, Kerrouchen. J. Gajowniczek photo. 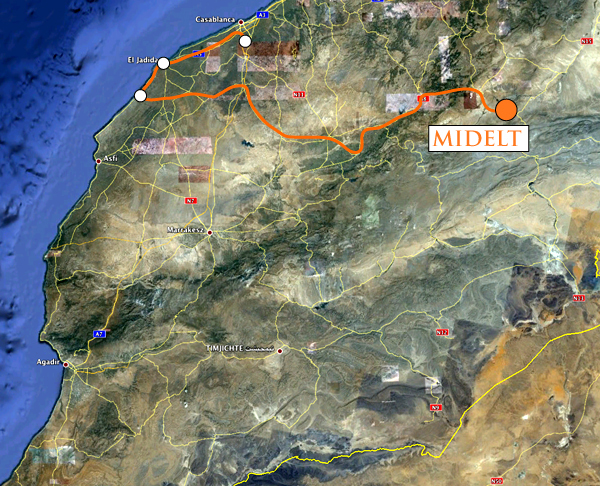 Later we returned to Midelt. 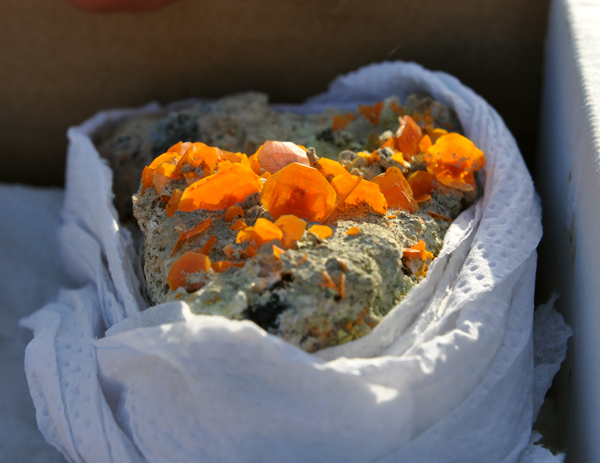 There was also a find of very good quality wulfenites in Adeghoual, Mibladen, quite big crystals in well saturated orange color. Note the size of specimen. J. Gajowniczek photo. 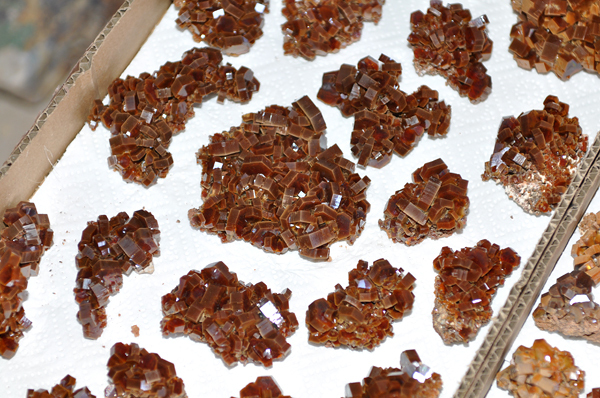 There was also a find of very good quality wulfenites in Mibladen, big crystals in orange color. J. Gajowniczek photo. 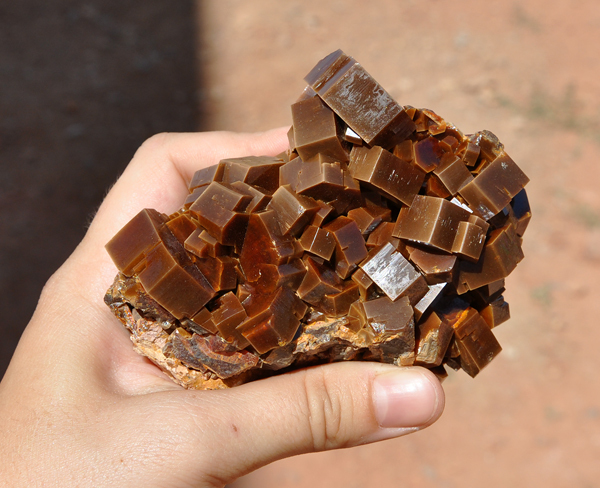 Another specimen of wulfenite, big crystal in orange color. J. Gajowniczek photo. A big gypsum from Bou Bekker, we like those specimens very much unfortunately they do not like to be transported and this is their big disadvantage. J. Gajowniczek photo. 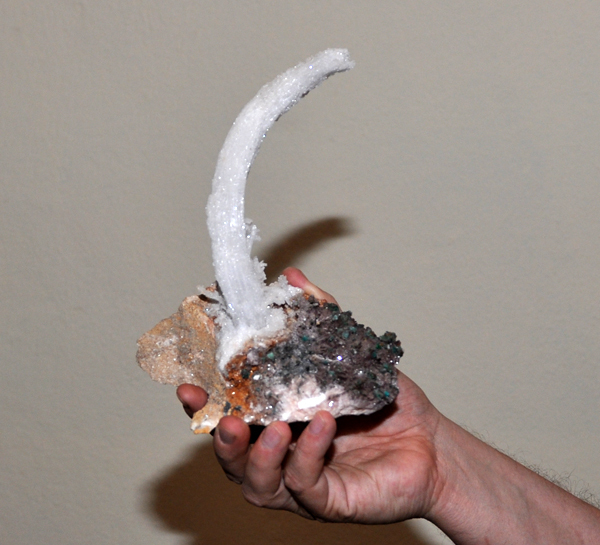 Another gypsum from Bou Bekker. J. Gajowniczek photo. And another new find of wulfenites. These ones are from Bou Bekker area. J. Gajowniczek photo. 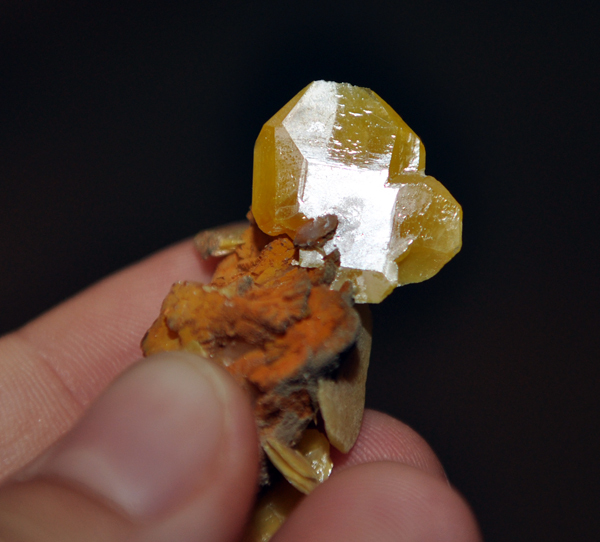 A new wulfenite from Bou Bekker - specimens are in more yellow color and smaller. J. Gajowniczek photo. 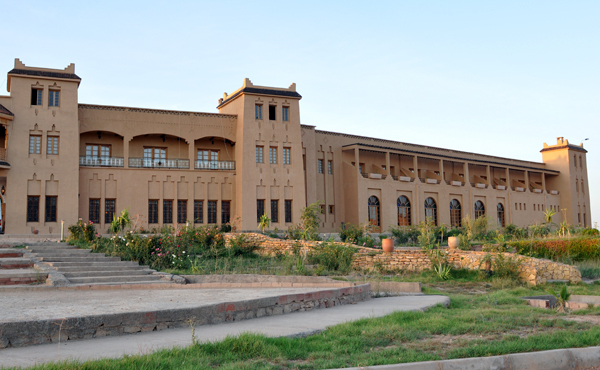 We spent a lot of time on preparations to the 2nd Mindat.org Conference that will take place in Morocco in 2012. This is hotel Taddart in Midelt - our main base and place of the conference part. J. Gajowniczek photo. Hotel Taddart – main base of the 2nd Mindat.org Conference. J. Gajowniczek photo. Taddart hotel, here the conference participants will spent nights (during the day they will be too busy with field trips, perites and other activities). J. Gajowniczek photo. Great report Tom and Asia. As all your reports are. 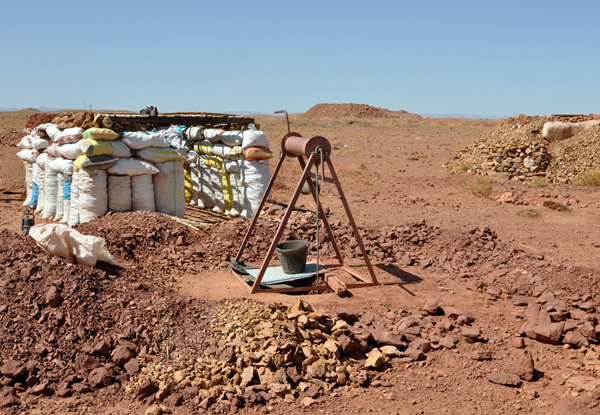 I like specially the balance between the mineral news and the touristic aspect. And with lots of photoes it makes the report really great. Very impressing the new finds of Vanadintes. The crystal habit and colour of each of those three different finds was amasing. And it must have been a hell of a sight when you where down in the mine looking at those beauties. I have been there myself but I did not see anything like this. Next time! And the orange Wuldenites was also very nice. And I think the price too! It is very calming to see that the second Mindat conference is under planning and will take part in Midelt next year. The Munchen Show is not that far away. 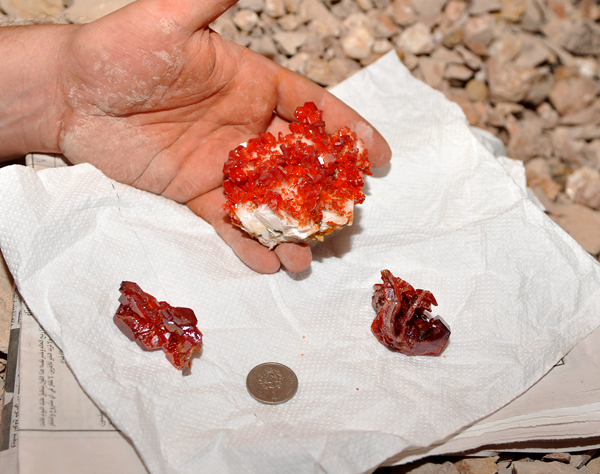 Hopefully these new Vanadinites, Wulfenites, specimens from Imilchil and Bou Azzer will be there. Hello! Thank you, I am happy you like our website and our reports. 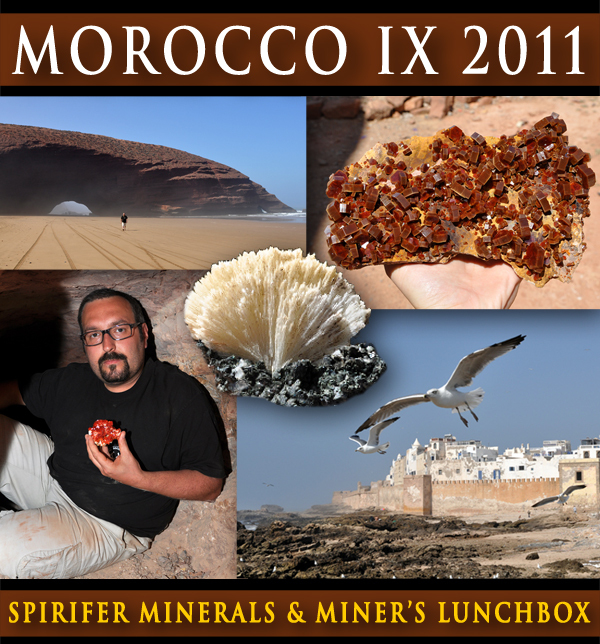 There are a lot of fake minerals in Morocco - they are mainly sold to the tourist in little shops by the road, they are very funny. There are also trilobites and other fossils made of plaster. Next time we will remamber to take some funny pictures and make a short report about the fake stuff. All the best from Warsaw!